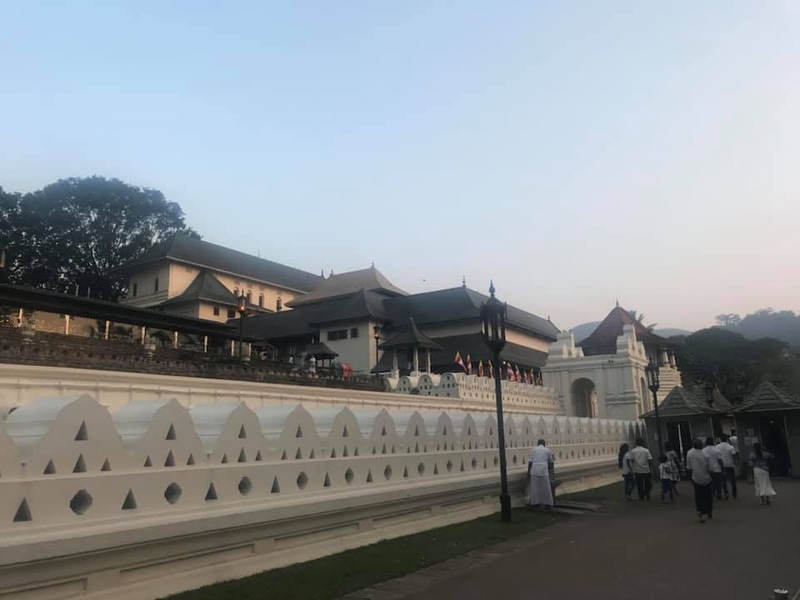 I recently returned from spending two weeks travelling around Sri Lanka and I would urge anyone to travel to this beautiful country. Its popularity is soaring at the moment so I would encourage you to visit sooner rather than later while it is still relatively quiet. 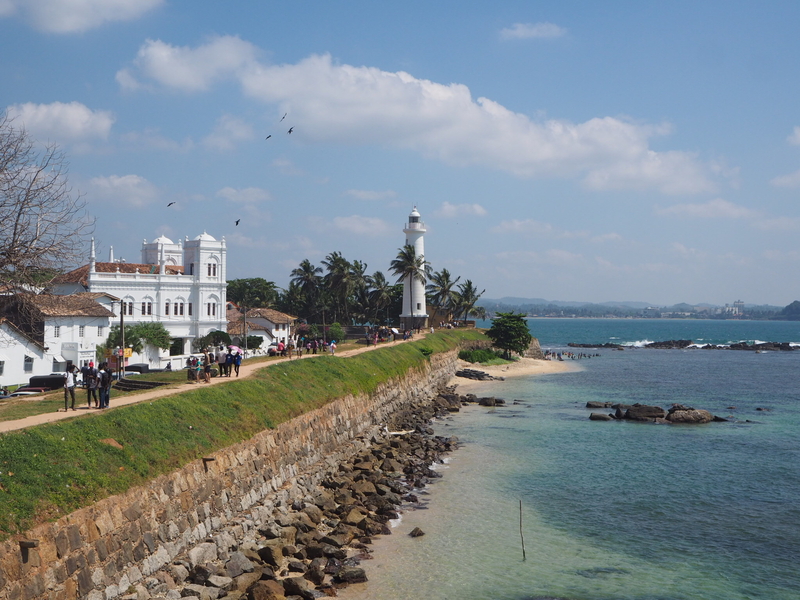 All international flights land in Colombo which is the capital city of Sri Lanka. 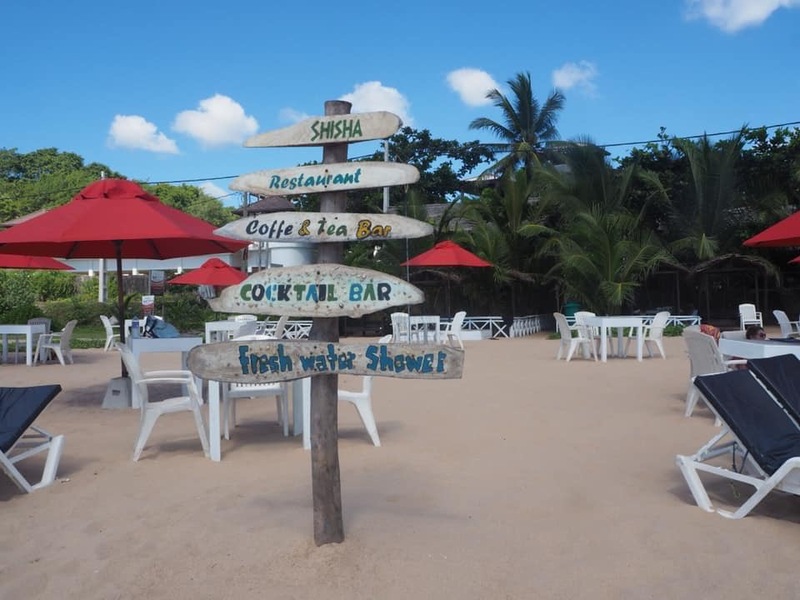 We stayed at Pegasus Reef Resort which was a forty minute Uber ride from the airport and just far enough out of the hustle and bustle to be relaxing. We arrived around midnight so we got an Uber straight to the hotel and went to bed. The next day we had a relaxing morning by the pool to recover from jetlag. Airport arrival – When you arrive at the airport there are numerous money exchange kiosks and ATM’s. As Sri Lanka has a closed currency you are unable to exchange any money before you arrive in the country. 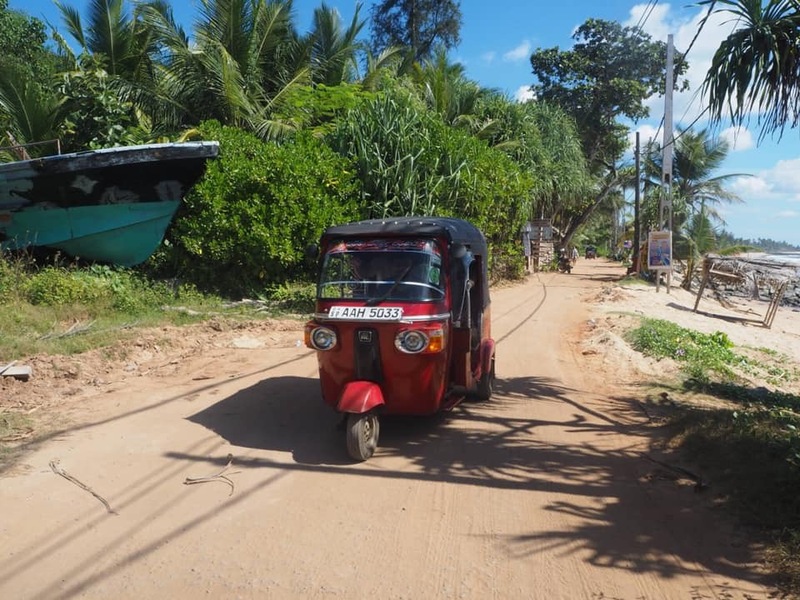 There are also a number of kiosks where you can get sim cards – I got a Mobitel one with 4GB of data for 1300 Sri Lankan Rupees ($NZD 10.59/GBP 5.60) which lasted me the whole trip. 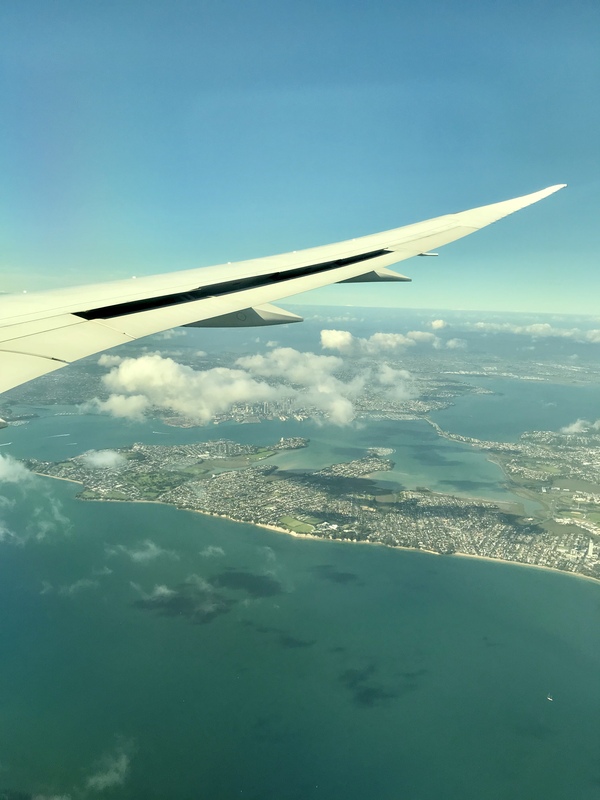 Uber – It’s really easy to get an Uber from the airport. Ignore all of the taxi drivers trying to get your business and walk out of the main doors of the airport, turn left and you will see a kiosk that says ‘Post Office’ – this is where Uber picks up from. 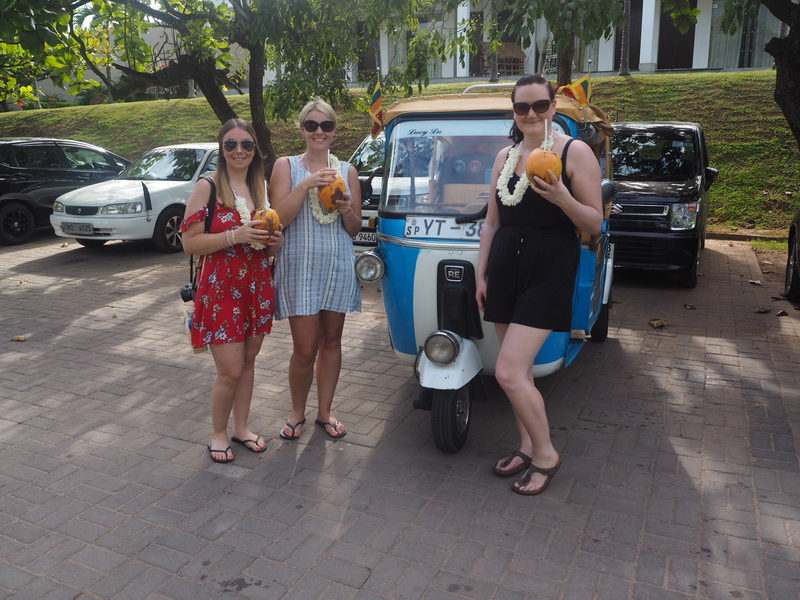 I can’t recommend Tuk Tuk Safari enough – Colombo can be overwhelming to navigate on your own and it’s way more fun in a tuk tuk anyway. 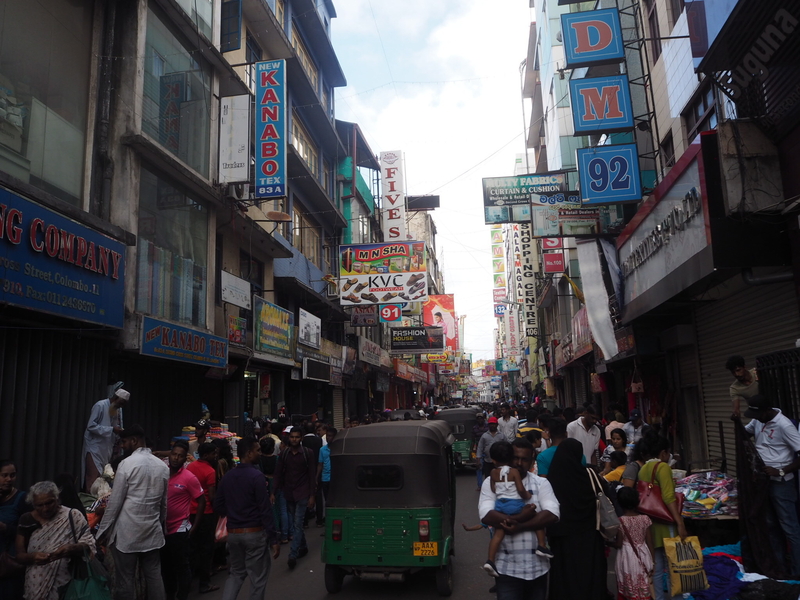 We were collected from our hotel at 3pm and taken on a three hour tour of Colombo in a private tuk tuk. We visited a Hindu and a Buddhist temple. navigated the busy streets, visited a tea shop and had a traditional Sri Lankan dinner of sweet and savoury hoppers, chicken kotthu and buffalo curd with treacle for dessert. 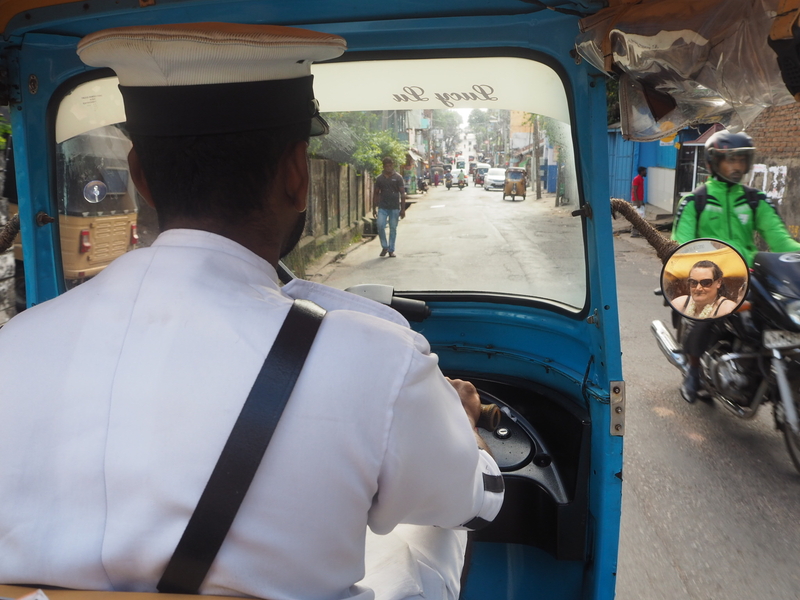 If there’s one thing you do in Colombo, make it a Tuk Tuk Safari. 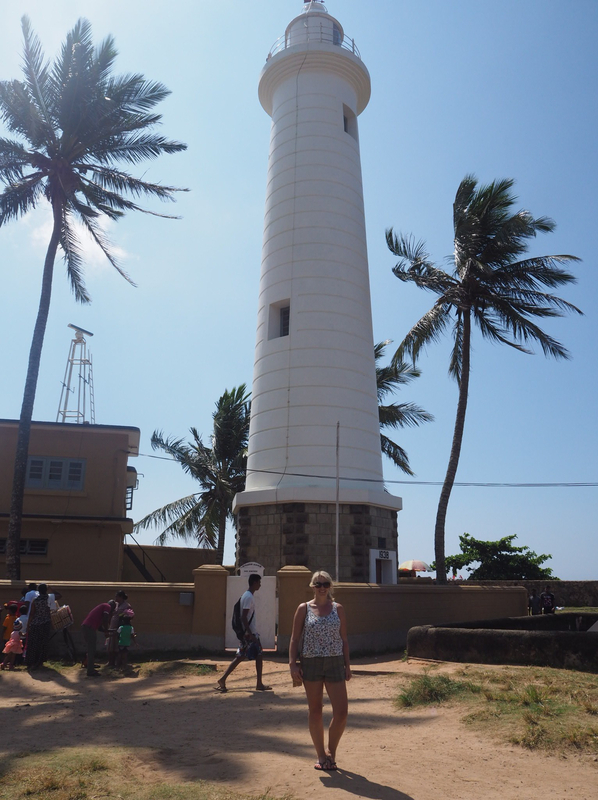 We left Pegasus Reef in the morning and set off for the two hour drive to the colonial city of Galle. It is super easy to arrange a driver between each destination. Just ask at your hotel reception the day before you want to leave and they will arrange it for you. Be sure to barter though – the rule of thumb is to halve the price they give you then you will both meet somewhere in the middle. 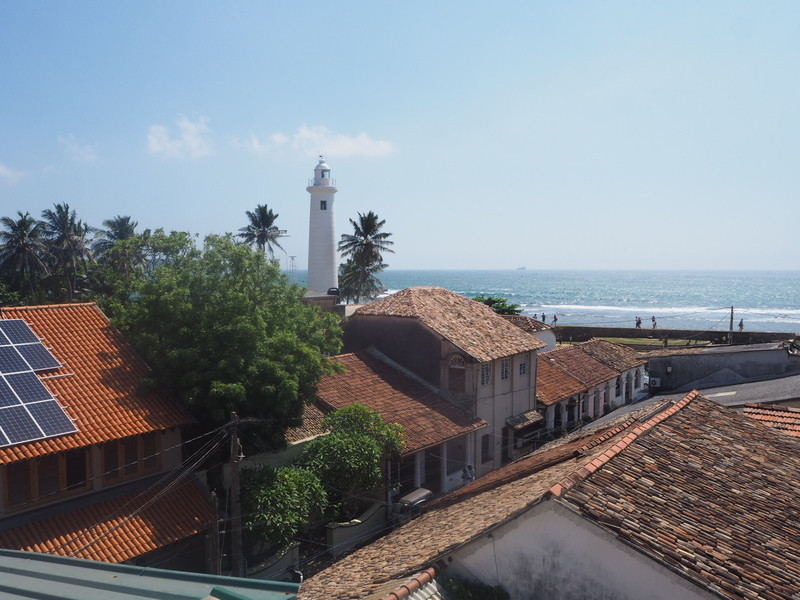 We spent half a day walking along the walls of the old colonial fort and the quiet, peaceful streets. A big change from the hectic frenzy that was Colombo. We had lunch at Mama’s Rooftop Restaurant which had spectacular views of the fort. 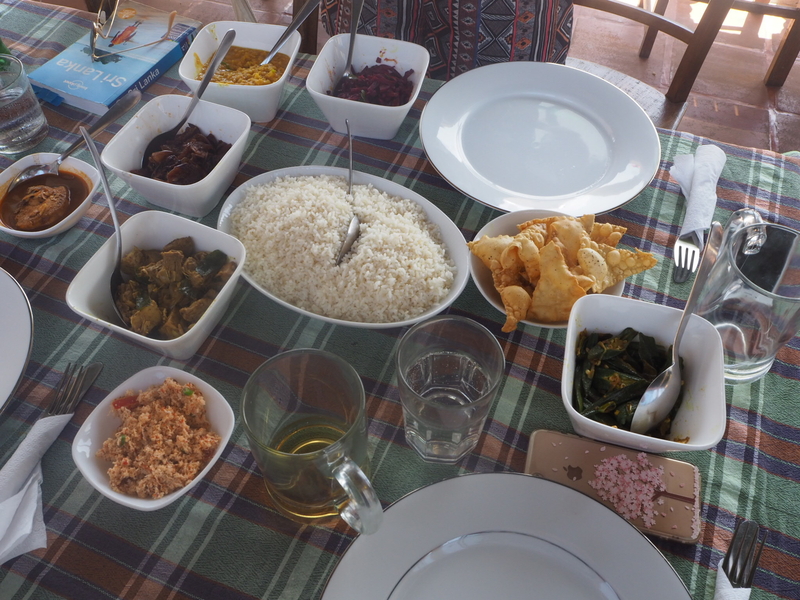 This was our first taste of the traditional Sri Lankan curry and rice and it was a great first impression. From Galle our driver (who had waited for us) took us to Unawatuna. Here we were staying on the beach so we had an afternoon of sunbathing and dinner with our toes in the sand. 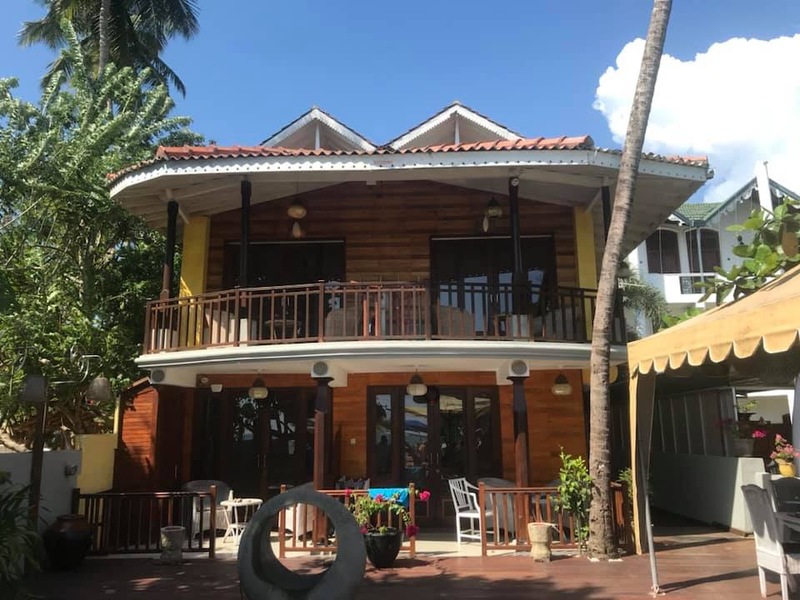 We stayed at Thaproban Beach House which was a great place to stay right on the beach. The hotel had it’s own restaurant on the sand so we feasted on fresh seafood for dinner. The calamari and prawns were particularly good. 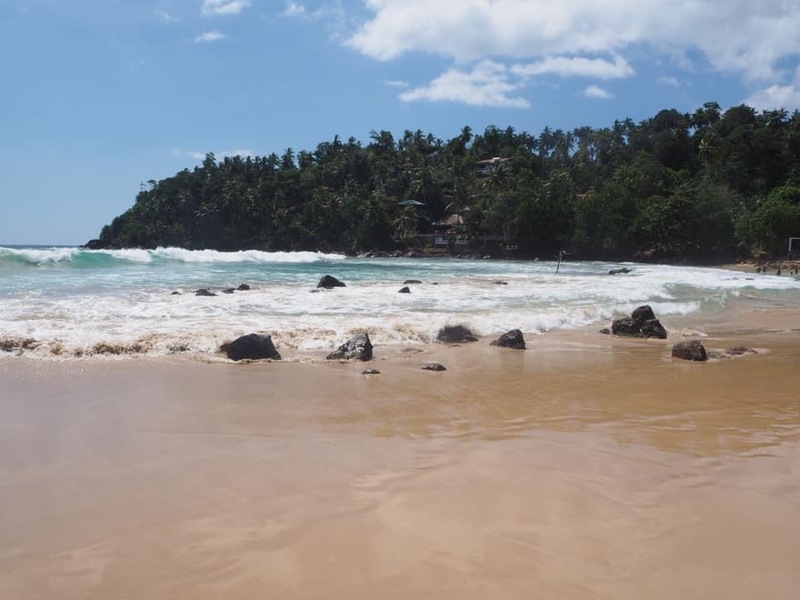 We left Unawatuna in the morning and drove to Mirissa – Mirissa is one of the most famous Southern Sri Lankan beaches. 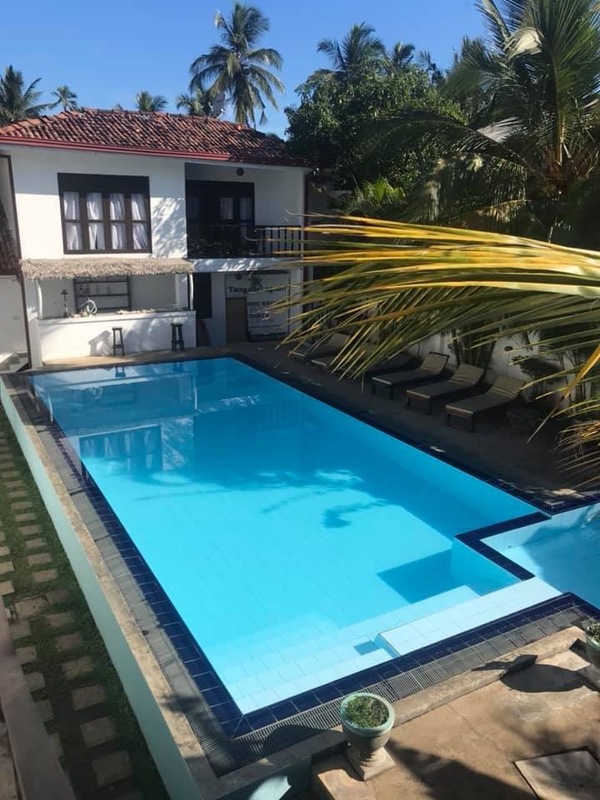 If you like a bit more of a lively atmosphere then Mirissa would be a better option to stay overnight but we really struggled to find accommodation here over the Christmas period. 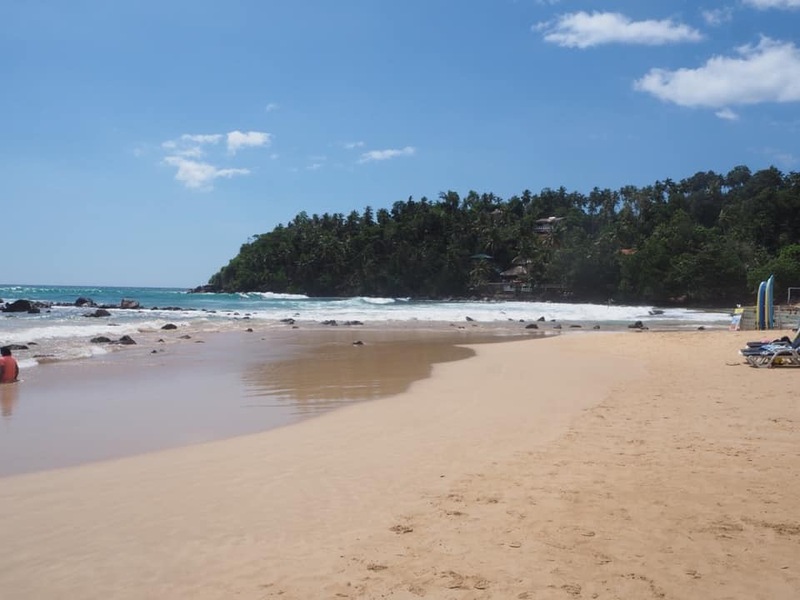 As a result we stayed in Tangalle which was a lot quieter but the beach was way more stunning and felt like you had the whole thing to yourself. 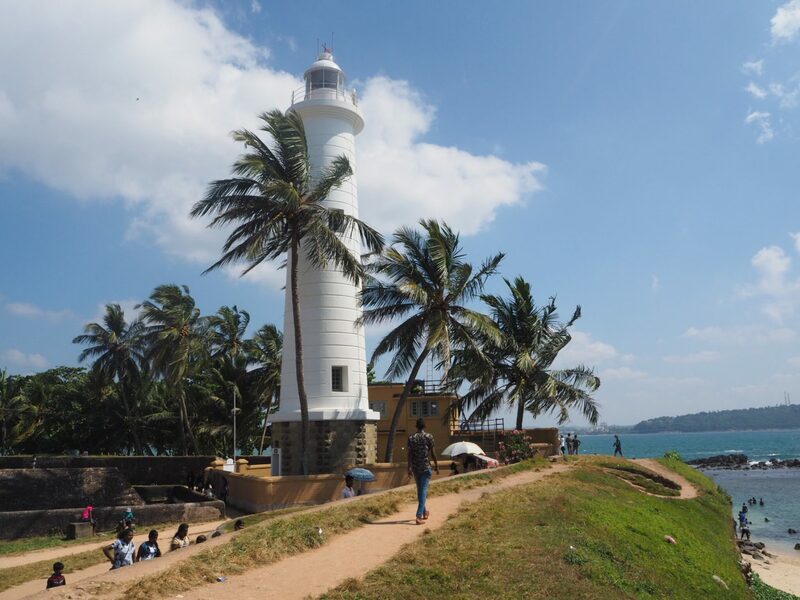 The photos below are of Mirissa which is still not overly busy but compared to Tangalle it was a lot busier. 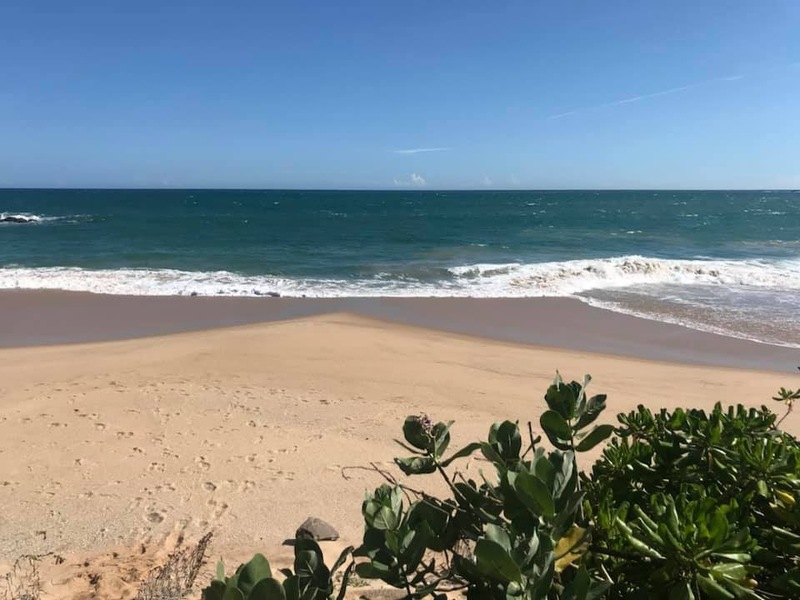 Stay: Villa Tangalle Lagoon for two nights. 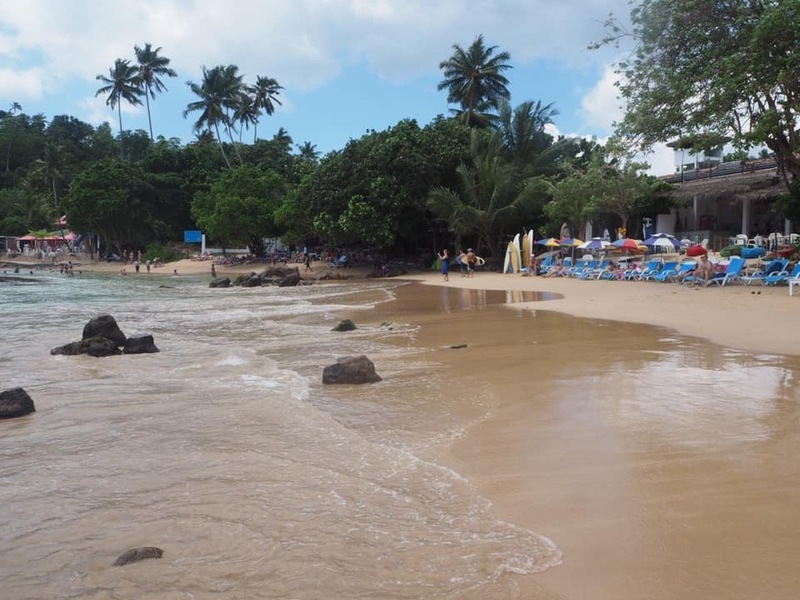 The beach at Tangalle is pristine and we spent Christmas Day soaking up the sun and dipping in and out of the sea. 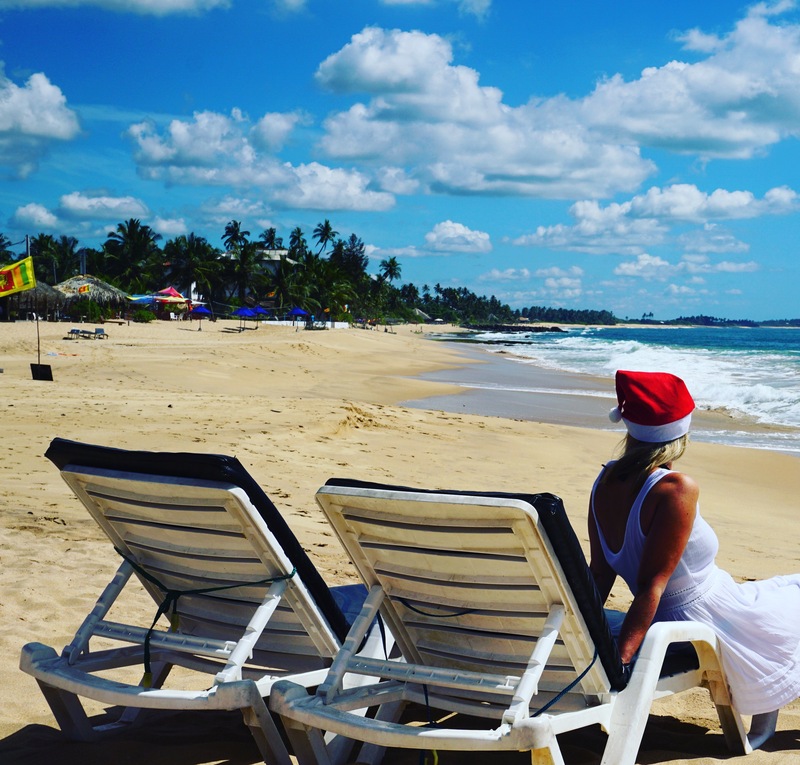 Lunch was had with our toes in the sand and it was the perfect tropical Christmas day. 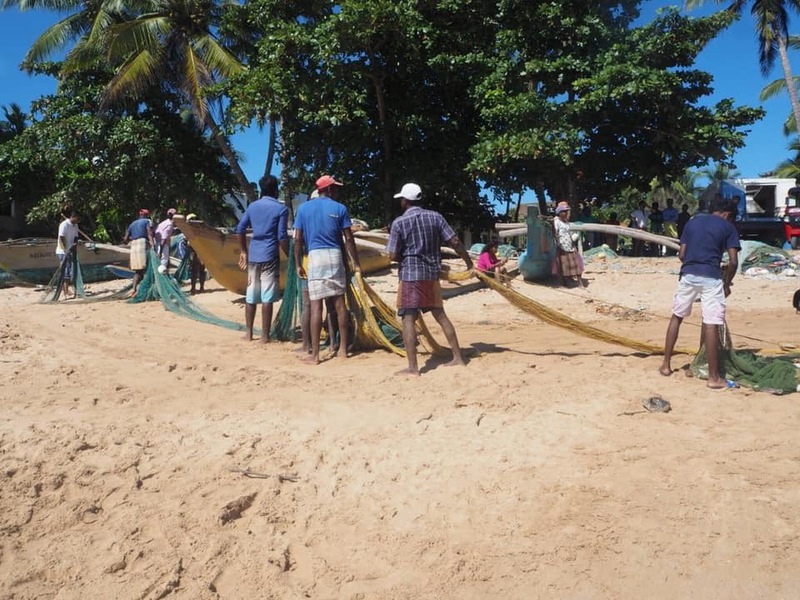 We even got to see the local fishermen bringing in the days catch. 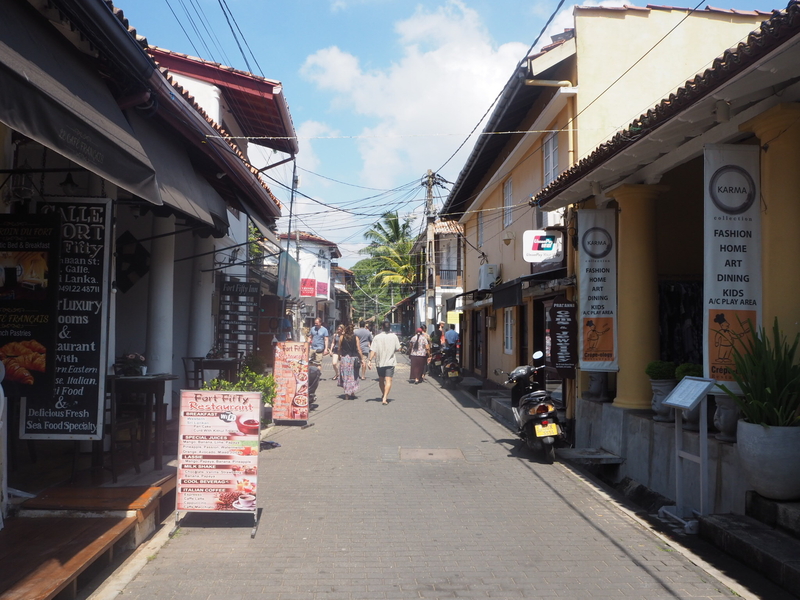 This was a typical street scene in sleepy Tangalle. Eat: The best restaurant in Tangalle in my opinion is Mango Shade. 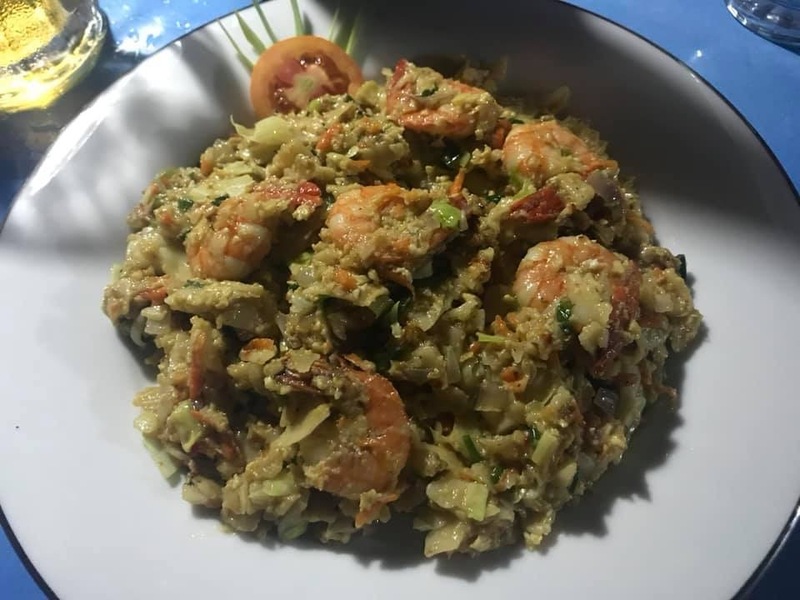 I had the prawn kotthu roti which was delicious and the start of many kotthu’s that I tried in Sri Lanka. One night we also ate at Red Beach which had a lovely setting and really great food. You can get your western food fix here if you want a change from curry but they also do Sri Lankan food too. I had the cheeseburger which was really good. 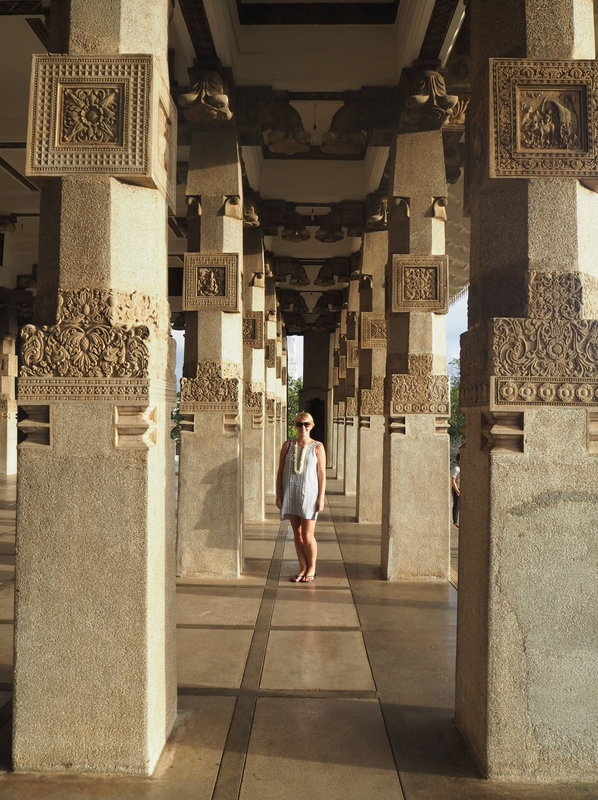 On Boxing Day we left Tangalle and headed to our next destination and the one we were most excited for – Udawalawe National Park. 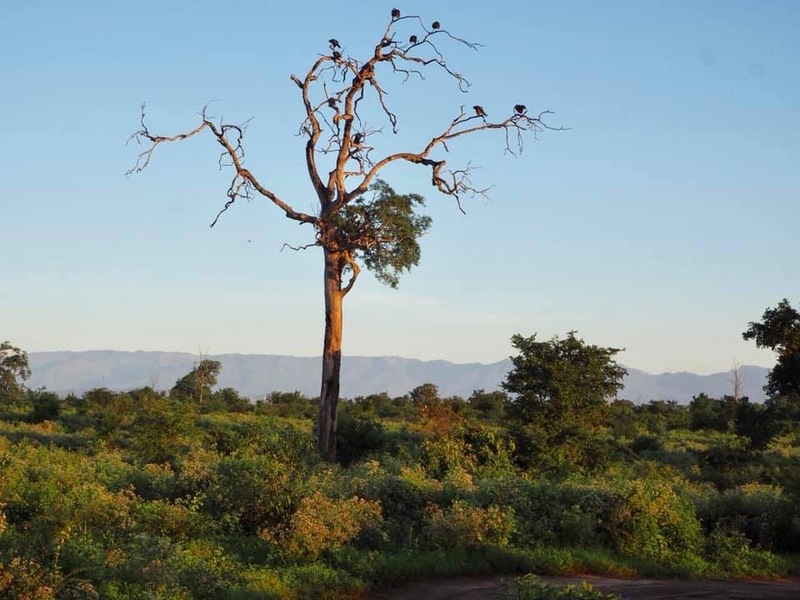 This is where you can do an elephant safari and view elephants in the wild. 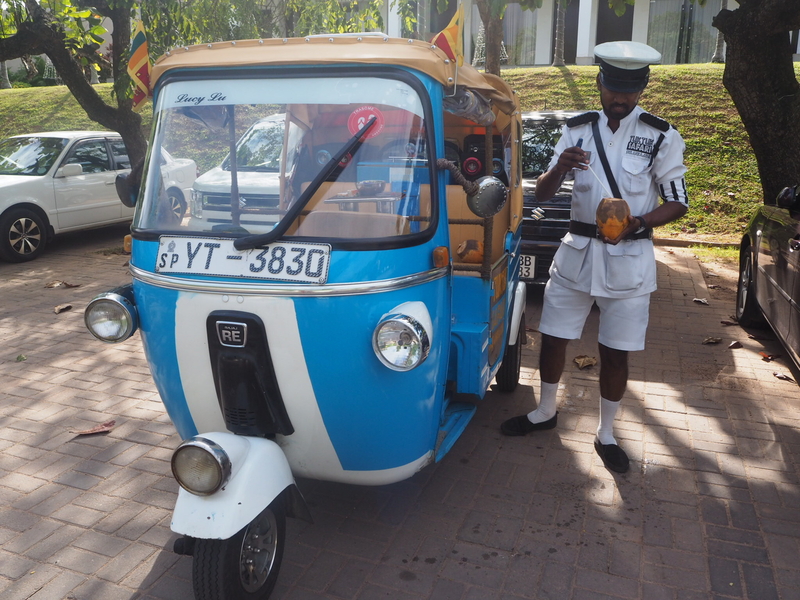 There isn’t really any amenities in Udawalawe and you will most likely take all your meals in the hotel. If you don’t like the traditional food you will have to do some research into somewhere that will provide western food or take your own. 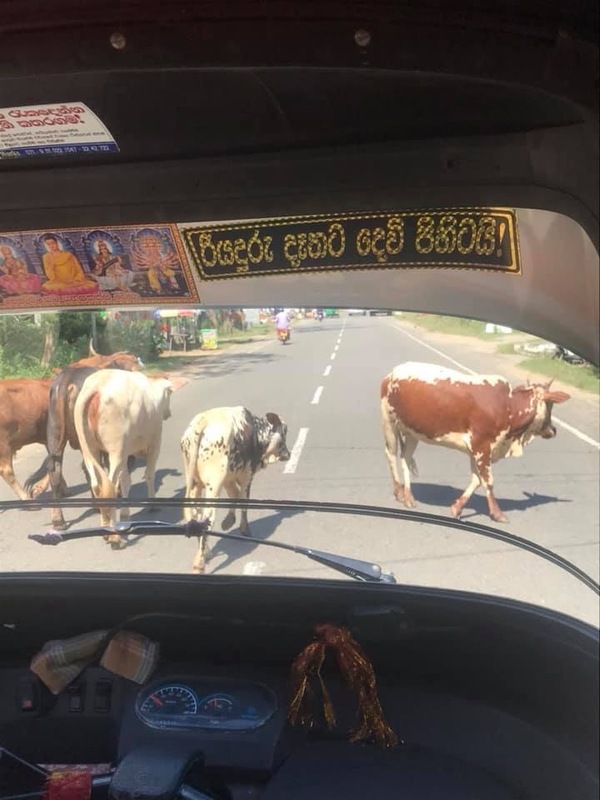 We met some traffic along the way…. This was probably our favourite hotel of the trip, we had all meals and the elephant safari included in our room rate and you can choose what time you go on safari. We chose the early morning option for the next morning. 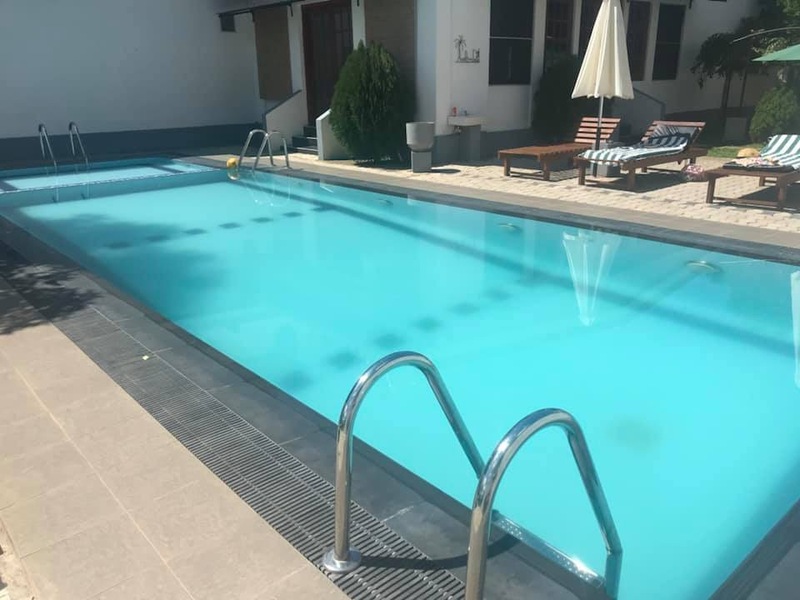 As there isn’t a lot to do in Udawalawe other than the safari we enjoyed an afternoon relaxing by the pool and were treated to a delicious Sri Lankan buffet dinner in the evening. We were up bright and early the next day ready for out 5.45am elephant safari. We were sharing the jeep with two others so there was plenty of room. 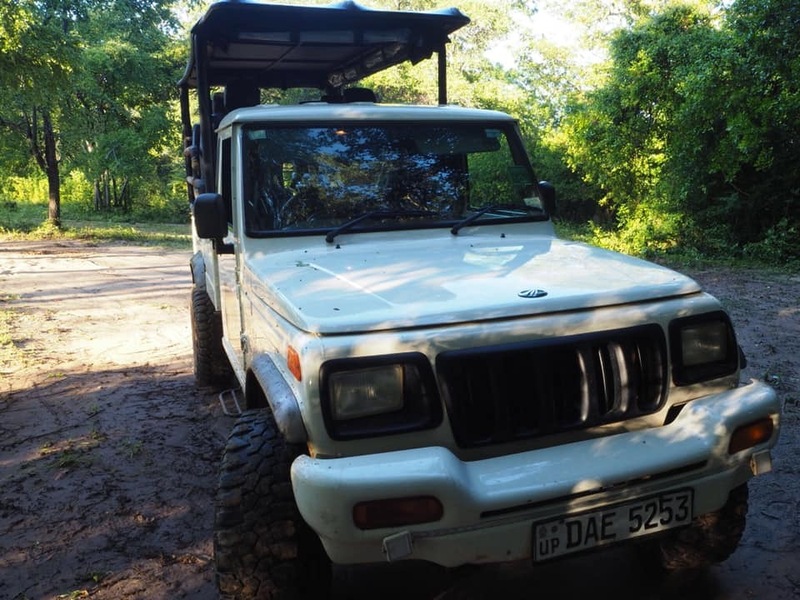 You will be queuing behind other vehicles to enter the park but once inside your driver is free to head off in whichever direction he chooses. 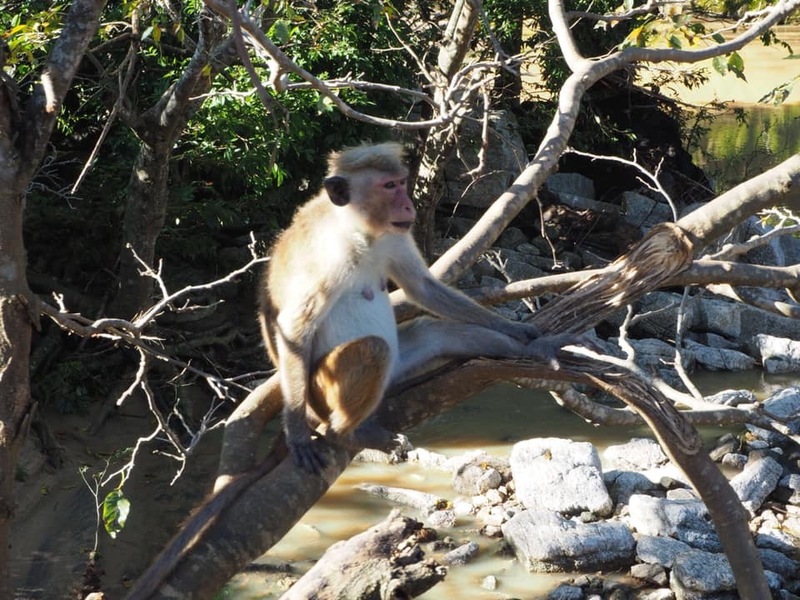 As well as elephants the park is also home to many species of birds including peacocks and water buffaloes and macaque monkeys. Have you ever seen peacocks perched in a tree before? 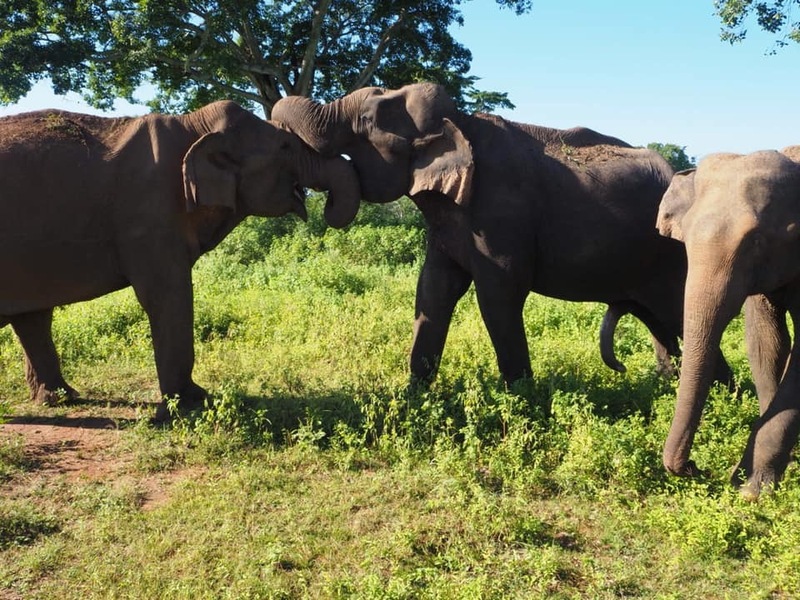 The drivers all seem to communicate as they drive past each other and give each other tips on where to find the elephants. 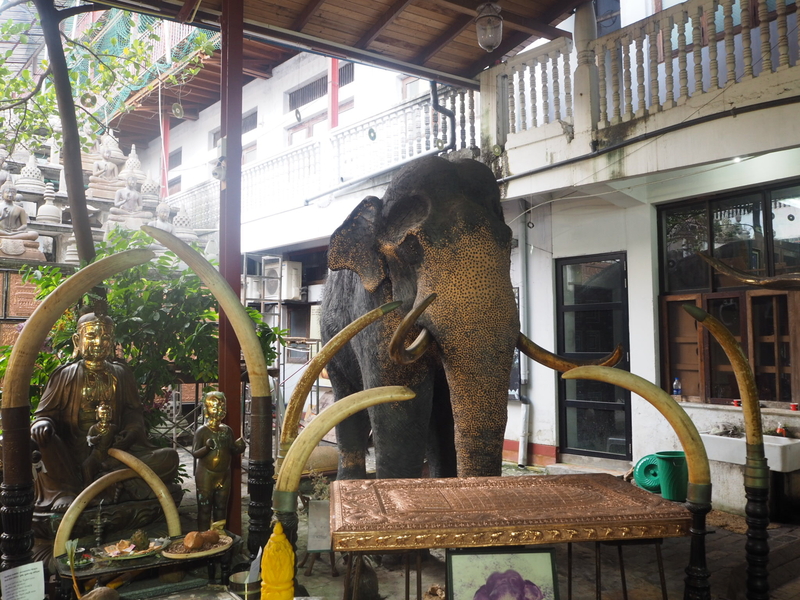 We couldn’t believe how close to the elephants we actually got. 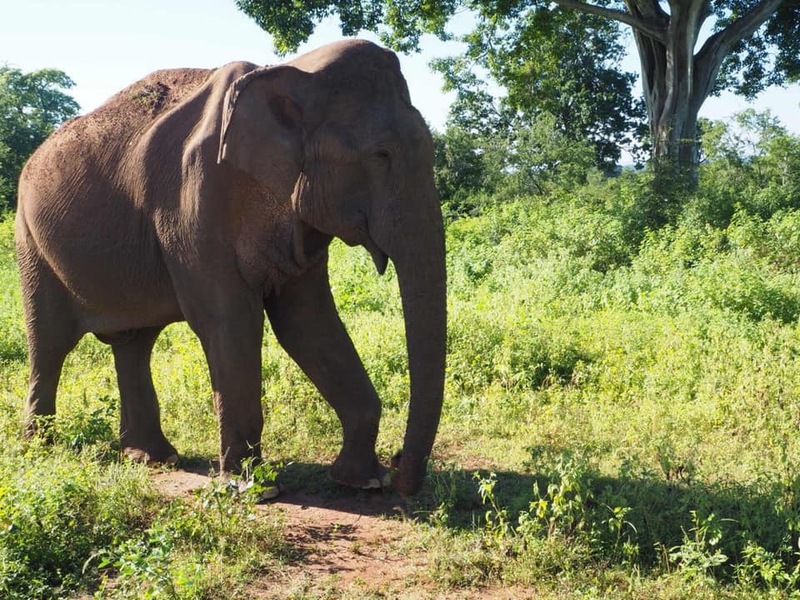 This male elephant originally had its back to us but our driver made some sort of noise and he turned around to give us a front on view. 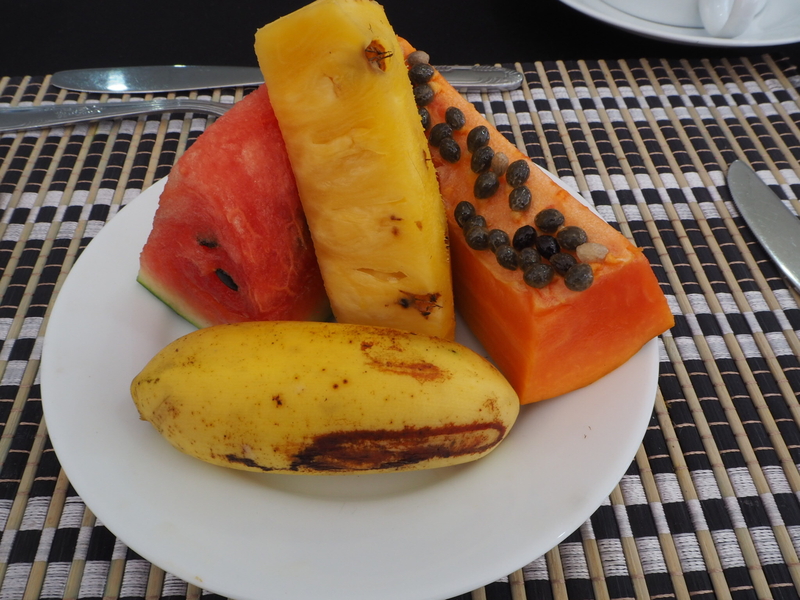 The safari lasted around two and a half hours and we headed back to the hotel where a breakfast of tropical fresh fruit and an omelette awaited us. 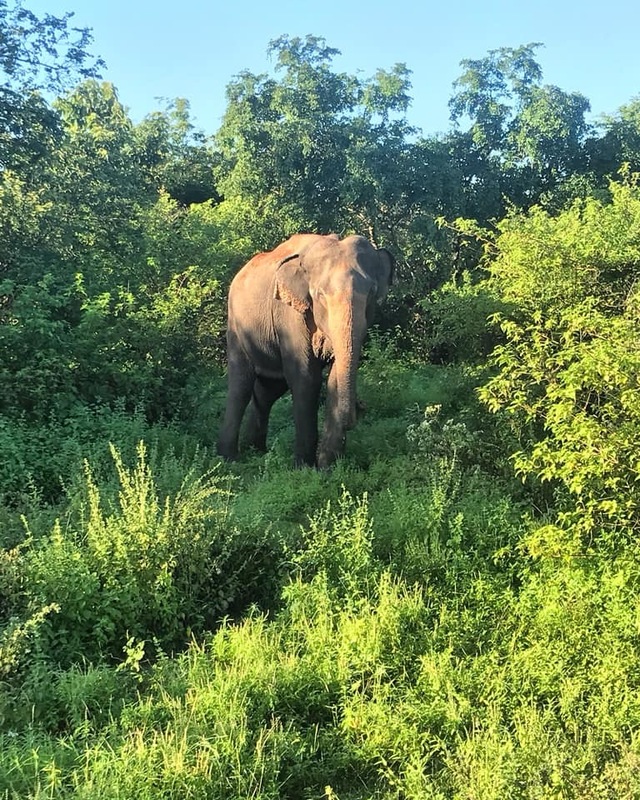 After breakfast in Udawalawe we set off for Ella. 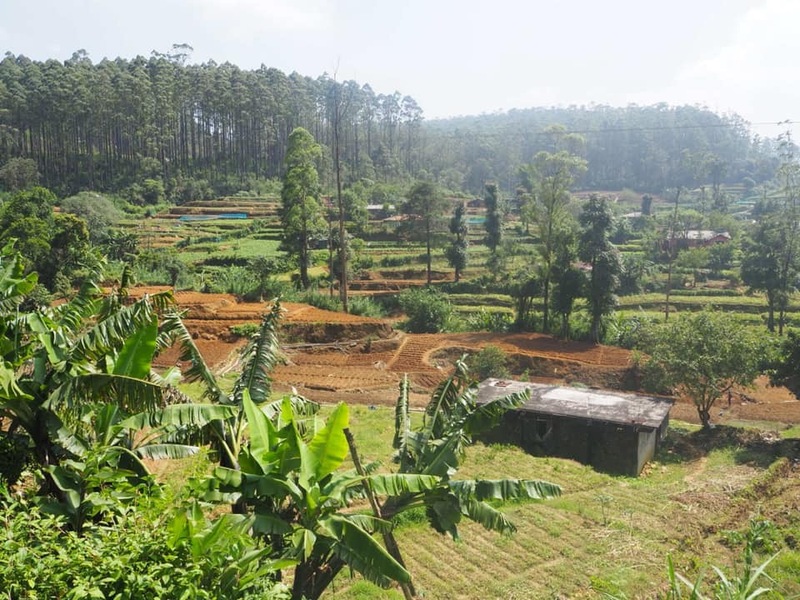 Here we planned to do do the tea plantations and some hiking. 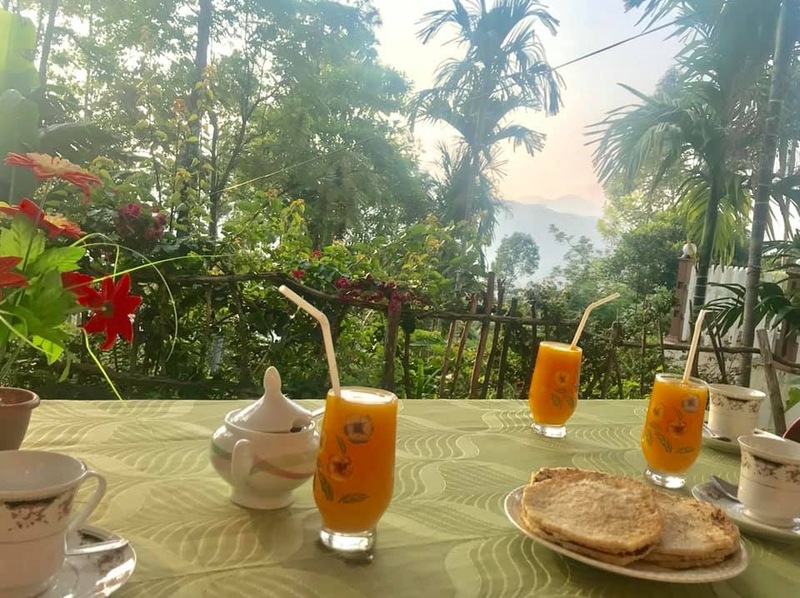 Our guesthouse in Ella was a short tuk tuk ride away from the town which gave it the added bonus of having stunning views from the terrace where we ate our breakfast each morning. 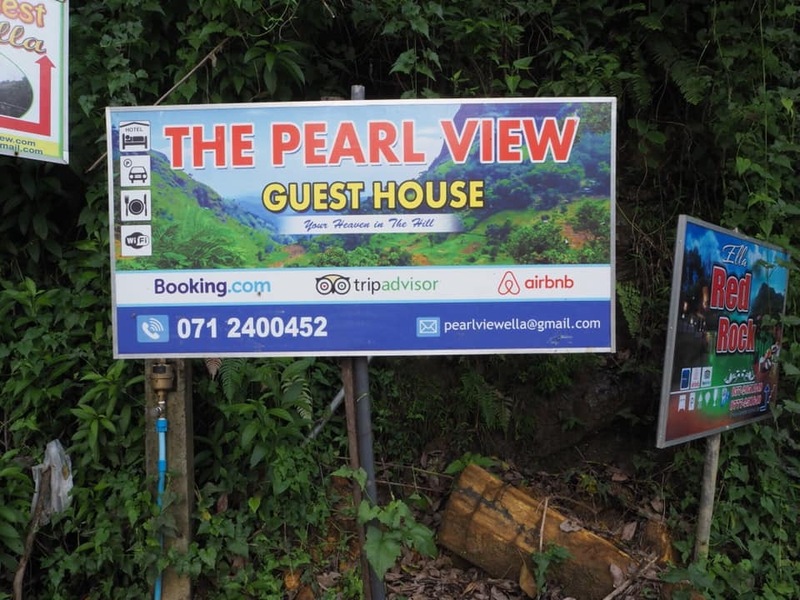 However the reason I can’t recommend this guest house is that nowhere on the description of the property did it mention that you have to walk up nearly two hundred steps to get to the property. If you are mobility impaired or just don’t want to walk up them all there is no other way to get to the property. It was fine for us but a bit sketchy when it rained or when coming back from the town in the dark as they are really steep. 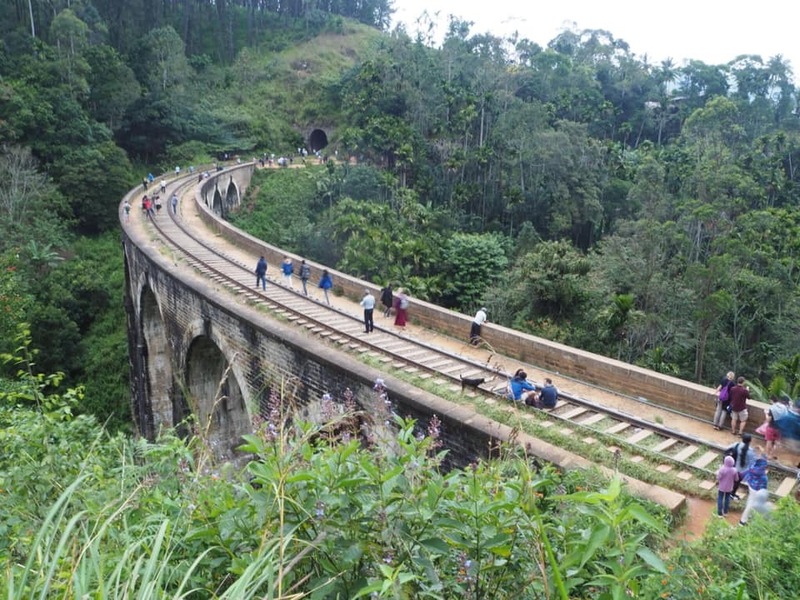 One of the best things to do in Ella is Nine Arch Bridge, an impressive feat of engineering. Try and time it for when a train is about to arrive (get there half an hour before the train is due to get a good viewing spot) but be warned – it is very busy. 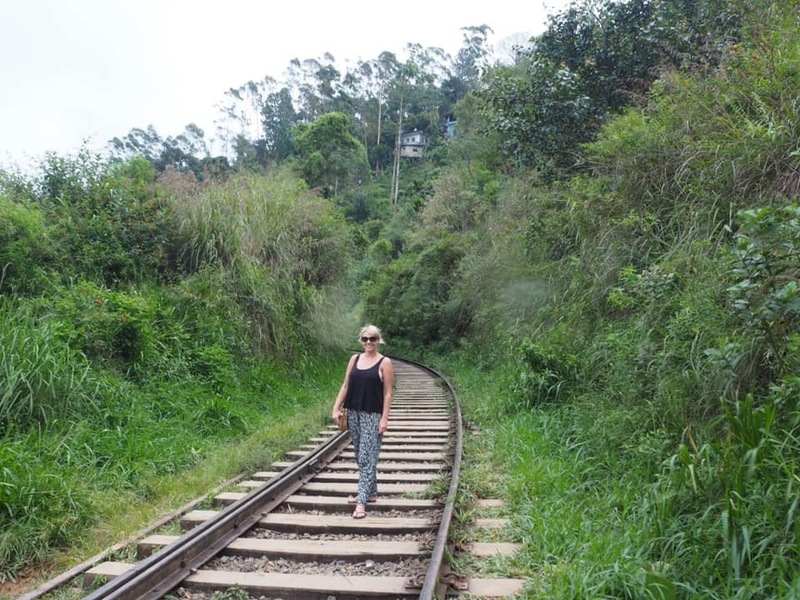 The trains don’t travel too fast so before one arrives everyone is free to wander along the tracks – you can even walk along the tracks into Ella town. 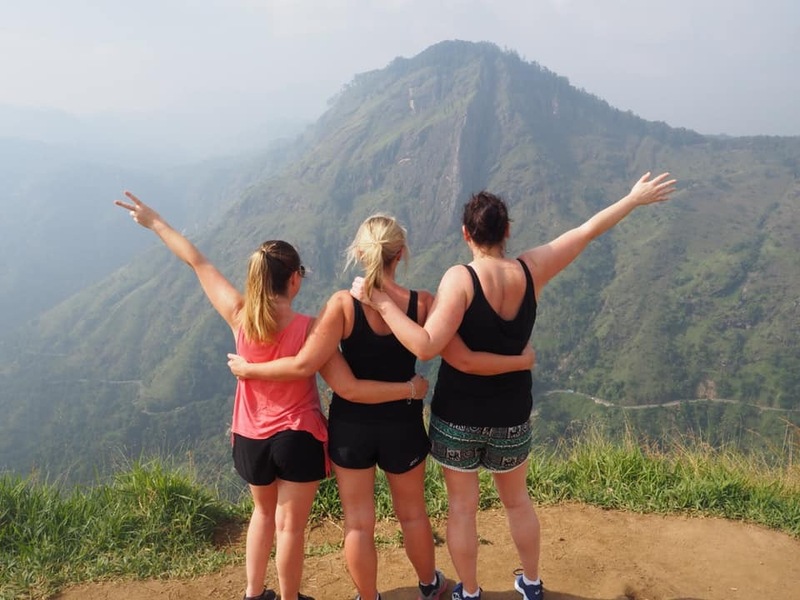 Little Adam’s Peak is not an overly strenuous hike but the views are really something. 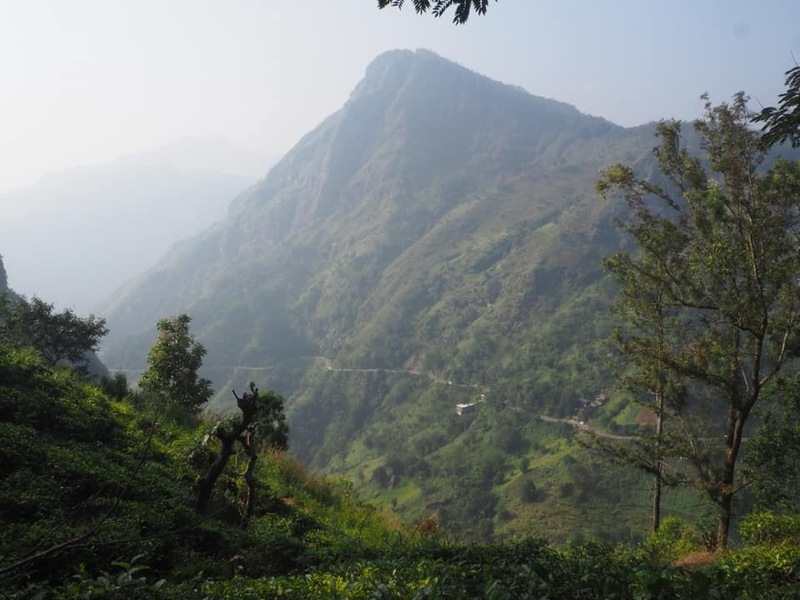 As you ascend you will pass local workers picking tea leaves in the tea plantations. Ella was the busiest, most touristy place we visited and you may have to wait for a table at Cafe Chill but it shouldn’t be too long a wait. 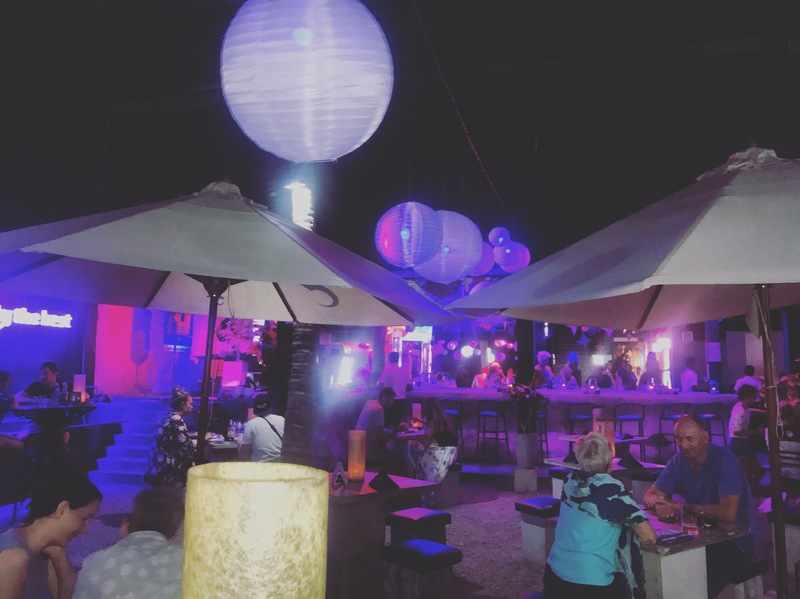 We shared a pizza and enjoyed the laid back Bali like vibes. 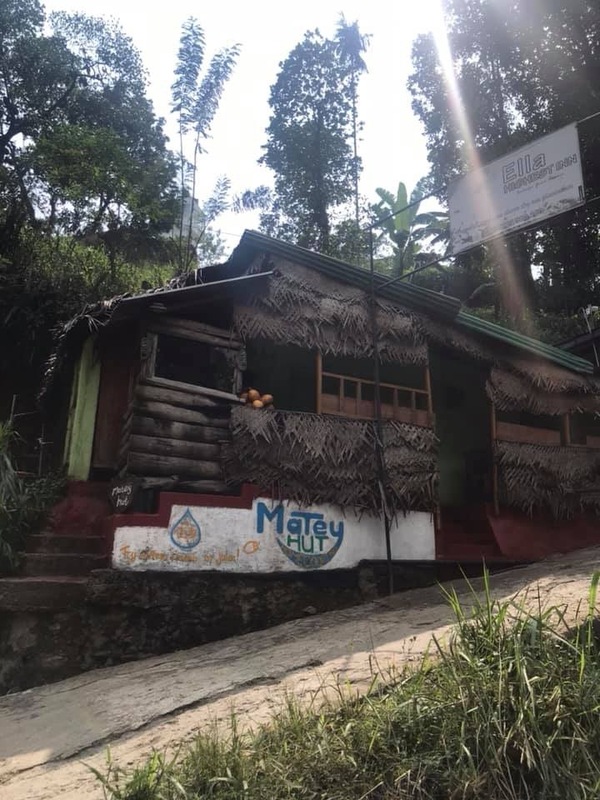 If you want to eat at Matey Hut (and you definitely should) get there half an hour before opening or expect a long wait or not to eat there at all. 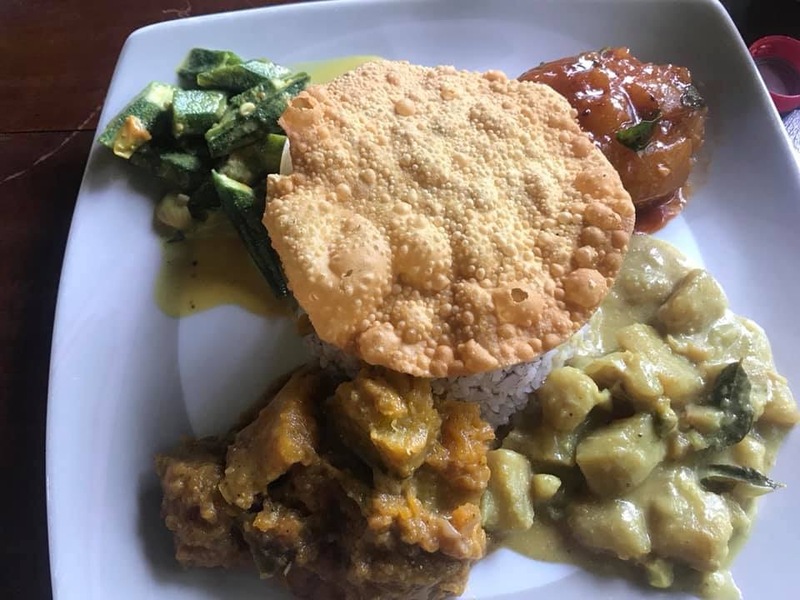 It’s a tiny place with only a handful of seats but produces some of the best curry in Sri Lanka. They also do cooking classes here. Not anything to write home about but the food was decent and nice enough and on this particular evening everywhere was so busy with quite a bit of waiting time. Situated next door to Cafe Chill, Dream Cafe has a similar vibe and equally tasty food. 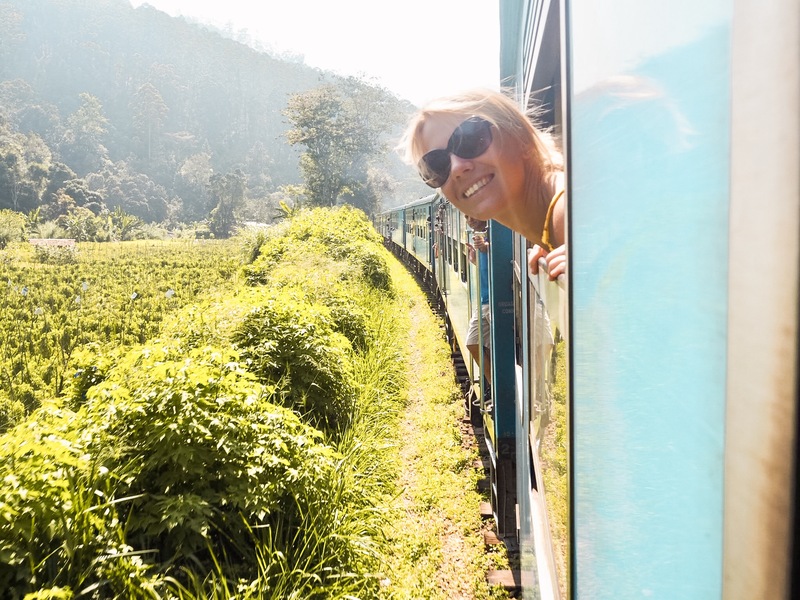 Known as one of the most scenic train journeys in the world, the train ride from Ella to Kandy is a seven hour journey through stunning scenery. 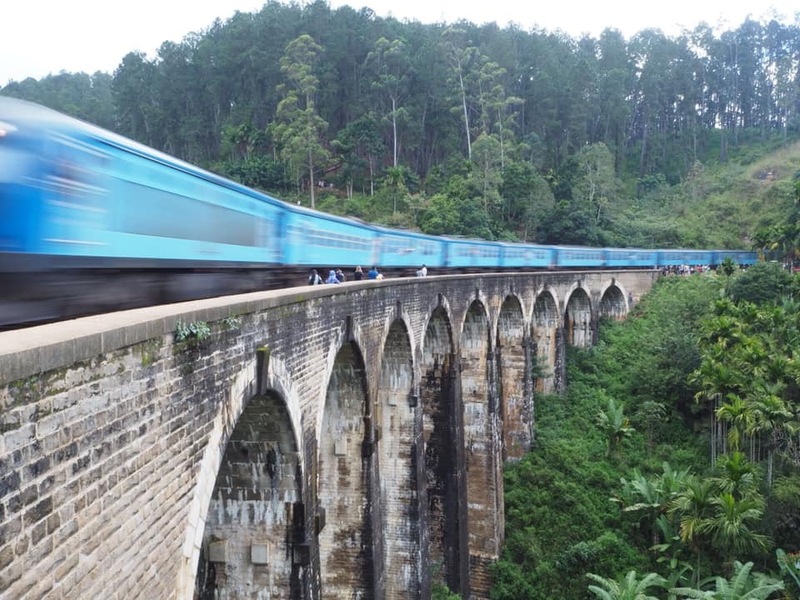 We had read that the first two hours of the journey from Ella to Nuwara Eliya were the most scenic so we just did the first two hours of the journey and got off the train at Nuwara Eliya. Our guesthouse in Ella organised our train tickets for us and we had second class reserved seats. I would advise against first class as the windows don’t open so you miss out on sticking your head through the window and hanging out of the train doors. 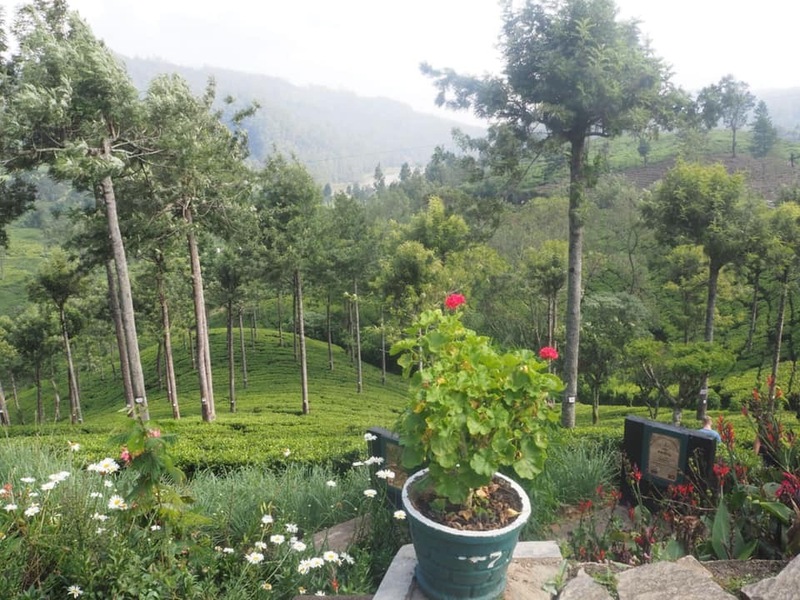 The scenery as we glided along was amazing with the tea plantations in full view. 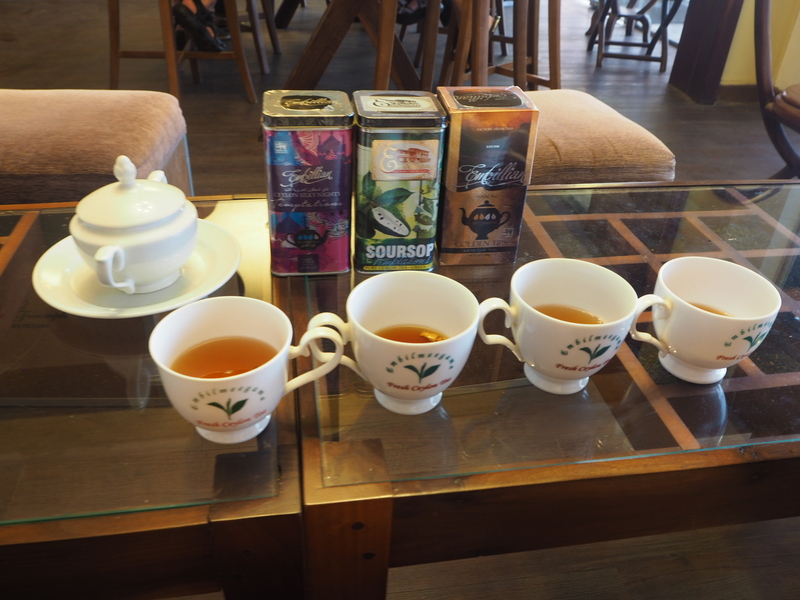 When we arrived in Nuwara Eliya we headed to Pedro’s Tea Plantation where we had a factory tour, got to wander through the tea leaves and enjoy a cup of Sri Lankan tea. 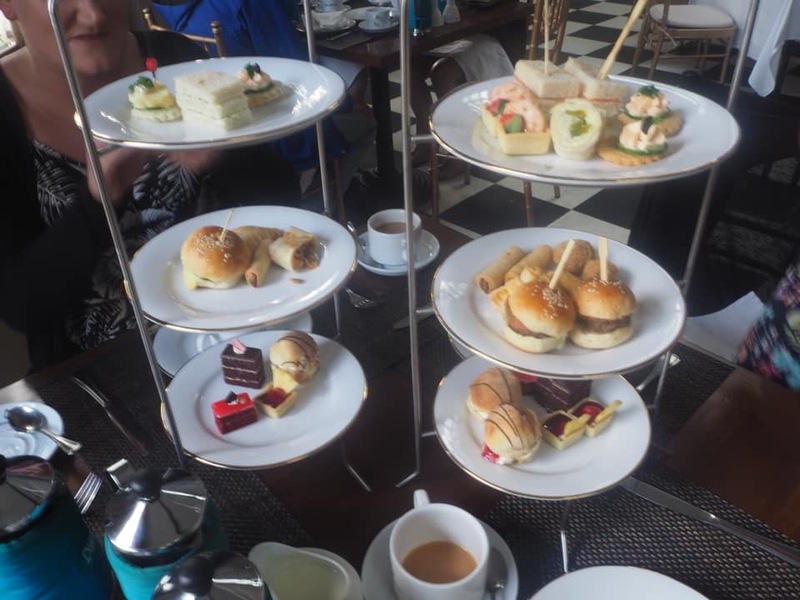 After some time at Pedro’s we headed to The Grand Hotel to have their famous afternoon tea. 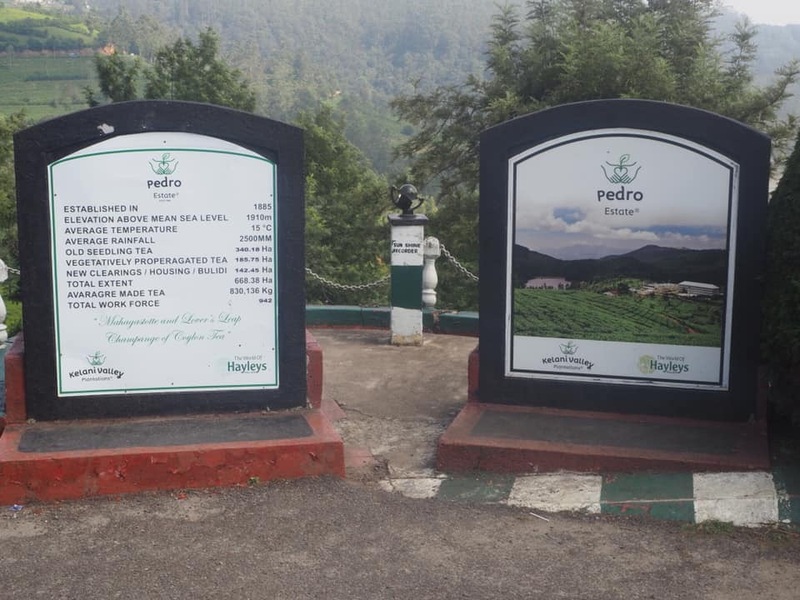 It was a lot cooler in temperature in Nuwara Eliya than anywhere else in Sri Lanka so make sure to wear warmer clothes and take a cardigan. 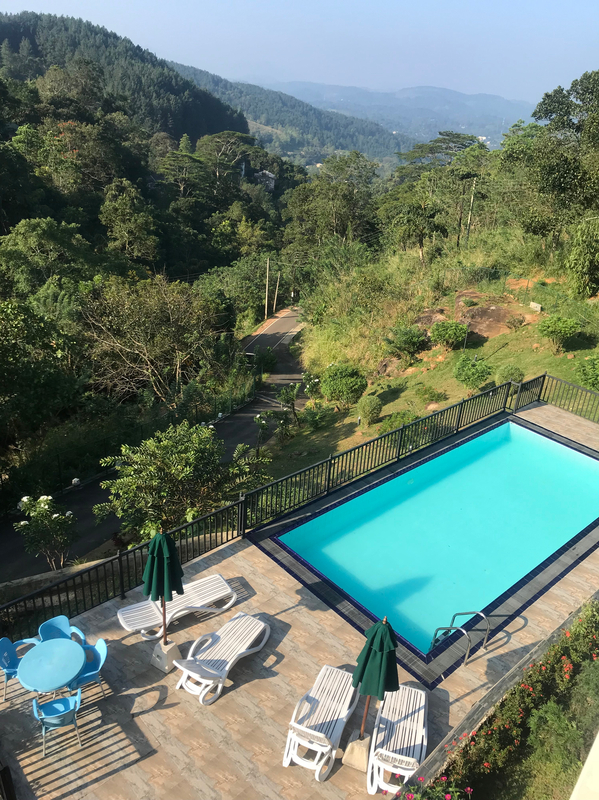 In hindsight we would have stayed just one night in Ella and stayed over in Nuwara Eliya for the night before heading to our next destination of Kandy. 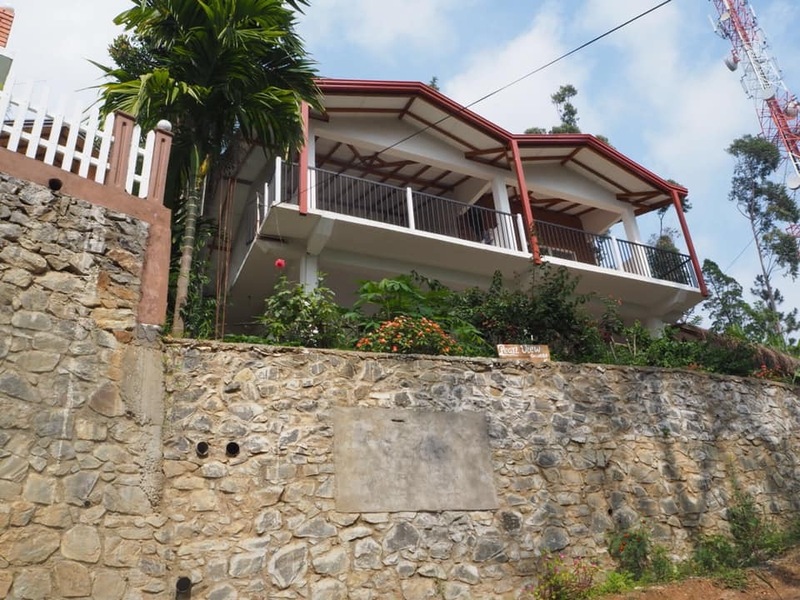 Instead we headed back in a taxi to Ella for another night and headed to Kandy from there the next day. 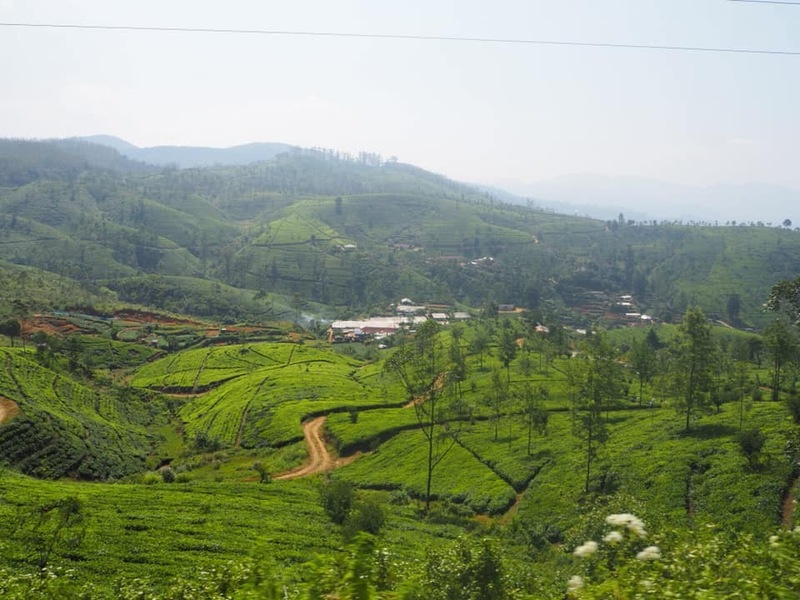 On our car ride to Kandy we drove through the tea plantations again and realised we were completely going back on ourselves. Still, it was a beautiful car journey and it showed us slightly different scenery to the train journey so we weren’t too upset about it. 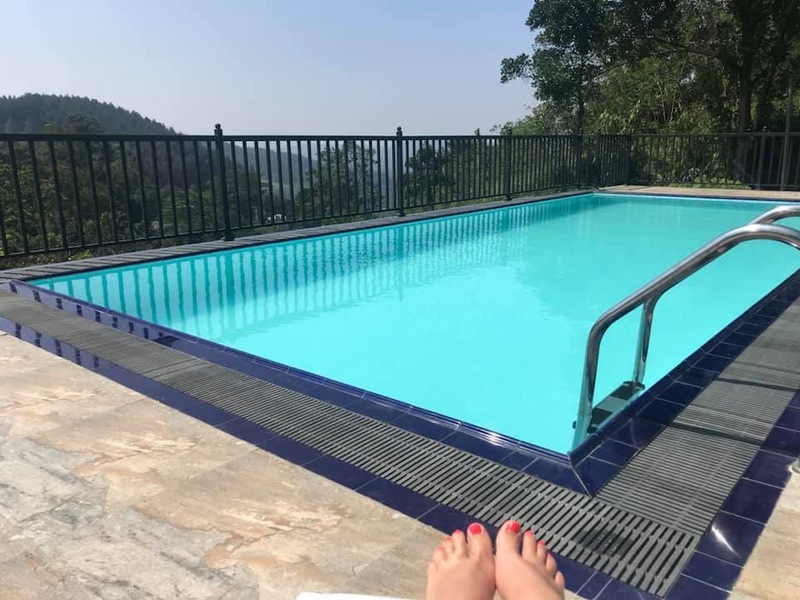 Kandy was around a four and a half hour car journey from Ella so we arrived at our hotel pretty late. We really liked this hotel and the pool area and views were stunning. As we arrived late the first night we had dinner at the hotel before going to bed. 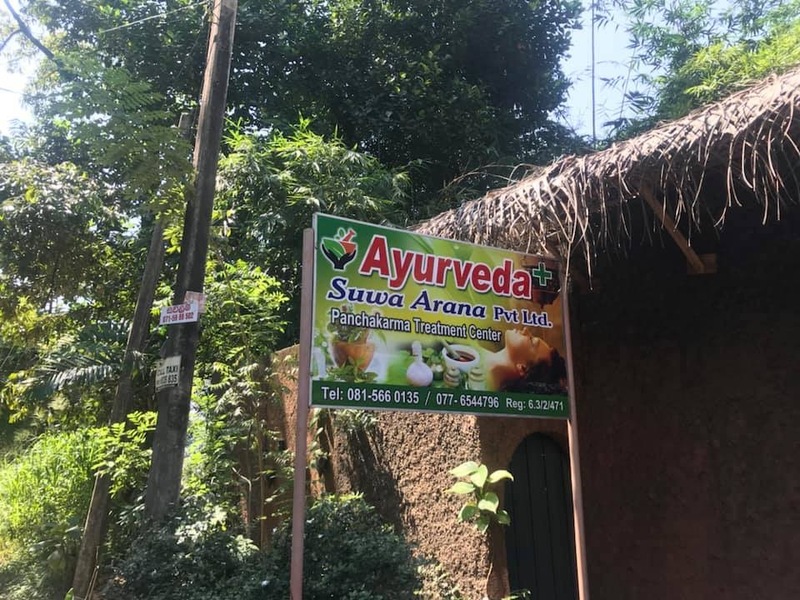 Sri Lanka specialises in Ayurvedic massage and the massages are so cheap that we had three while we were in Sri Lanka. 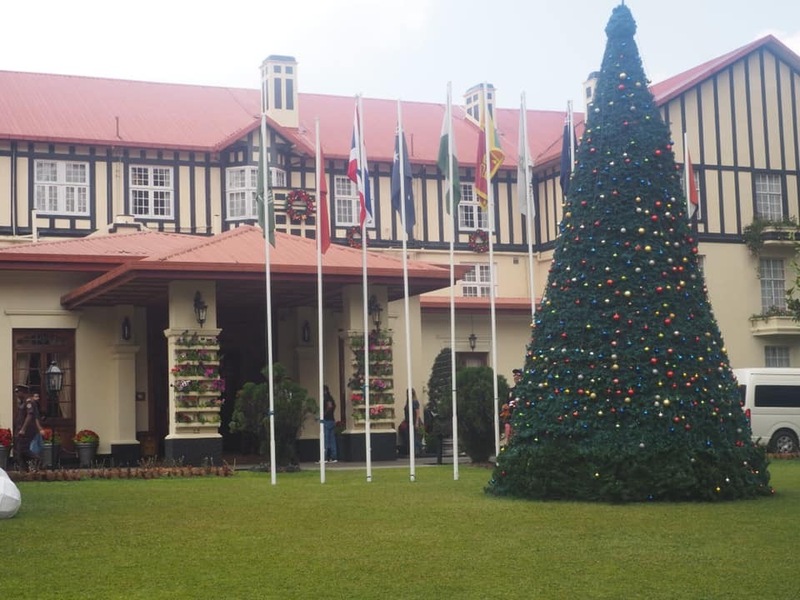 The best one was in Kandy and this was arranged by our hotel who provided transport to and from the ayurvedic centre at no cost. 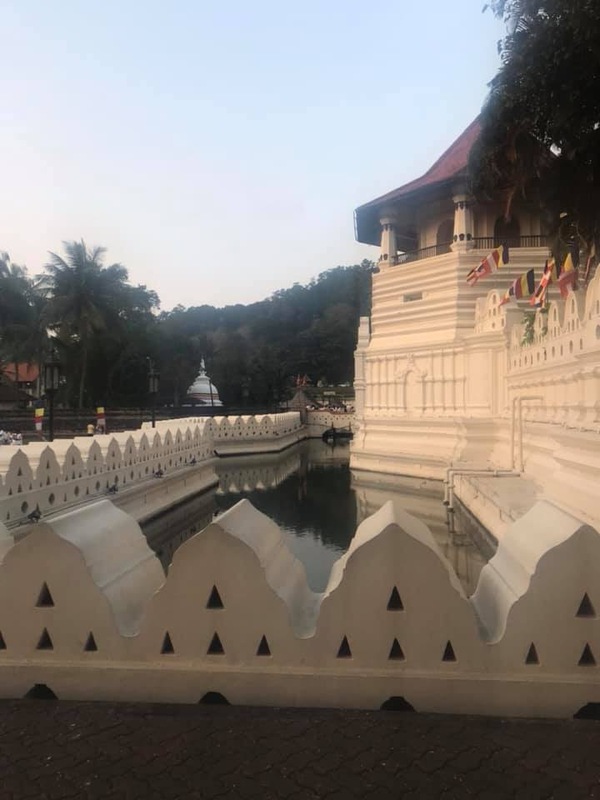 The top thing to do in Kandy is visiting the Temple of the Sacred Tooth. This is a magnificent, imposing building. There is a small charge to enter the temple although you can wander the grounds for free. You must have your knees and shoulders covered to enter. It didn’t look like they were providing anything to cover yourself with like some temples do so make sure you wear covered clothing or take a shawl or scarf with you. 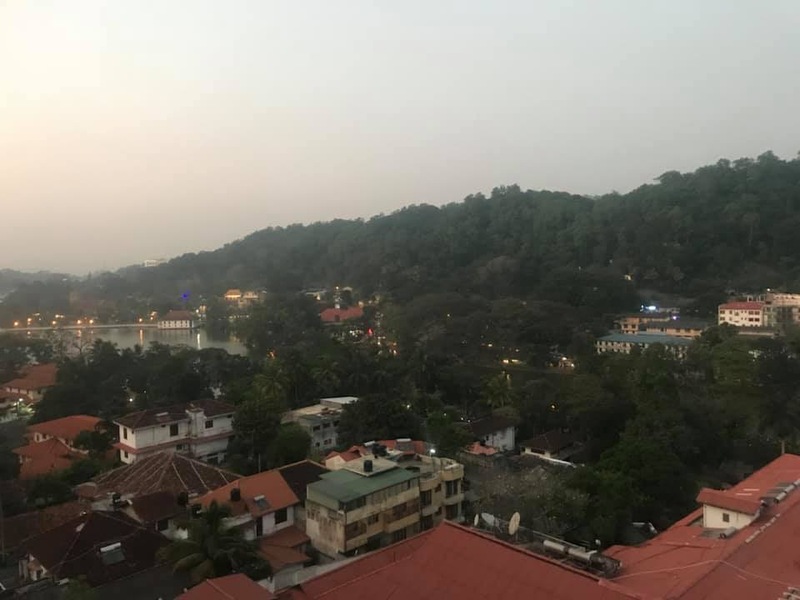 We also took a stroll around Kandy lake and enjoyed drinks at the rooftop bar of OZO Kandy with views overlooking the lake. I have never eaten at such a quirky, unique place before. It has to be seen to be believed. 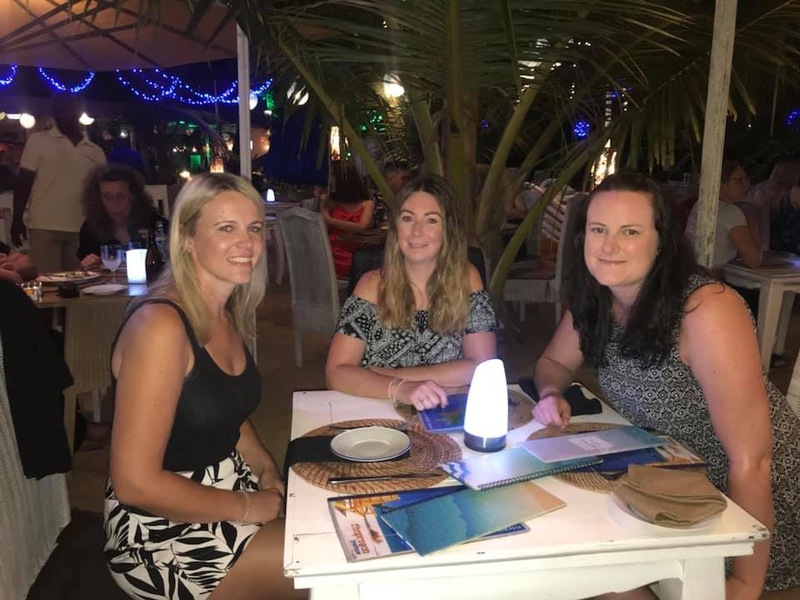 Service is slow but the food is good and there is a choice of three dishes per night. All meals are accompanied by coconut soup (surprisingly really tasty), bread rolls and dessert. 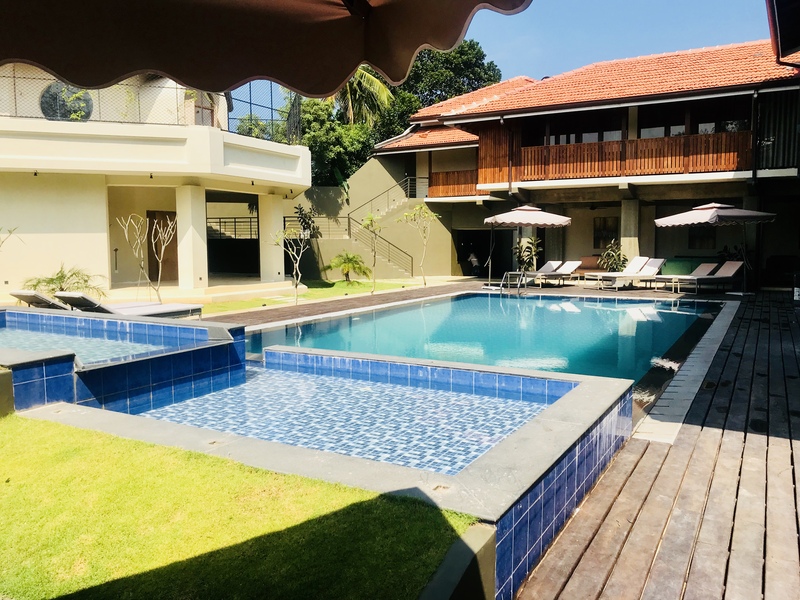 We stayed for two nights in Kandy and then headed to Negombo for three days of relaxation before flying back home from Colombo. 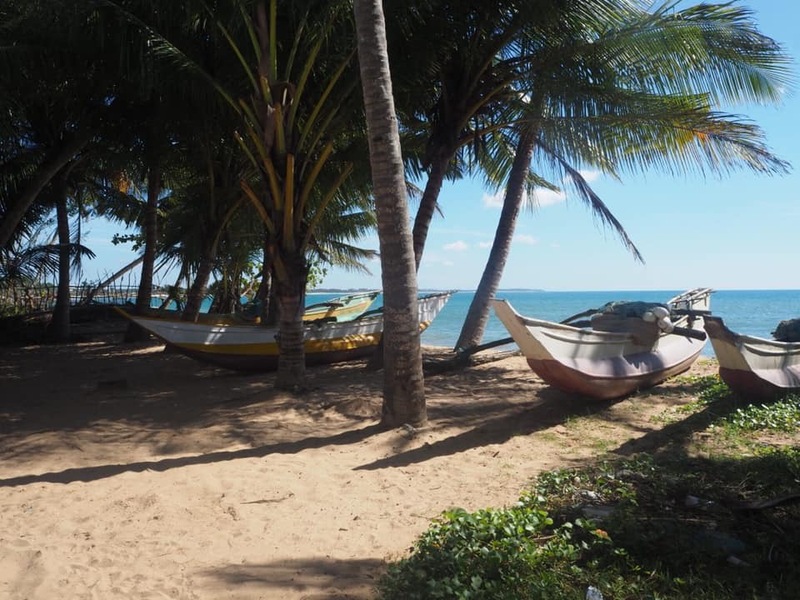 Negombo is actually closer to the airport than Colombo itself and has a beachside setting. 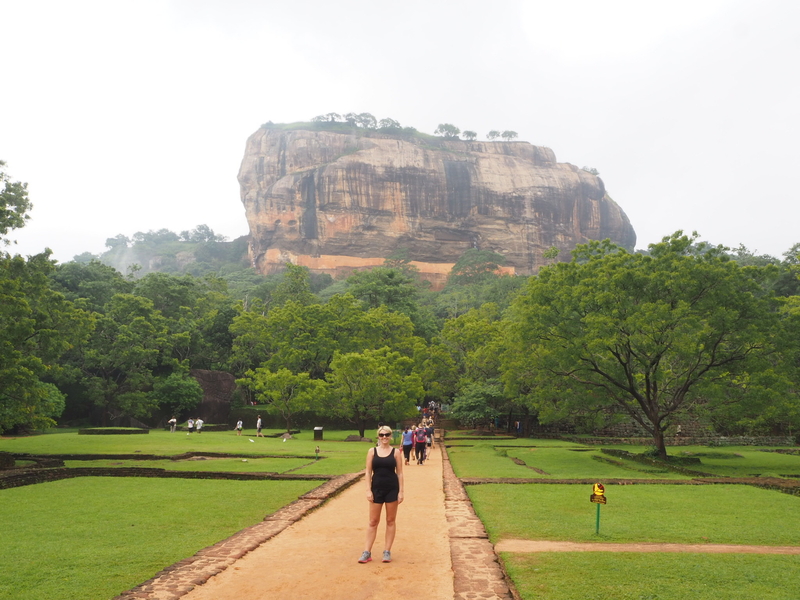 We decided to head to Sigriya (otherwise known as Lion Rock) from Kandy and then travelled onto Negombo. 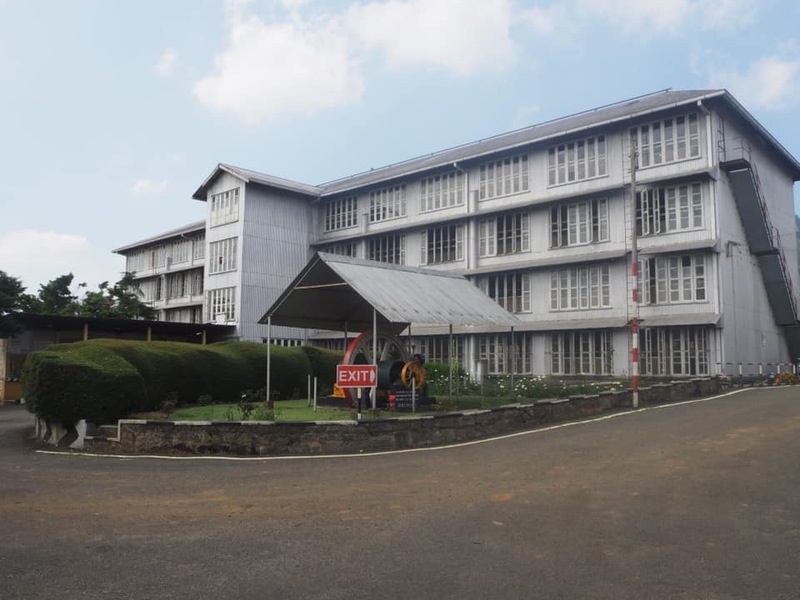 If you are not too fussed about visiting Kandy you could head straight from Ella or Nuwara Eliya to Sigriya and stay in a hotel there and get up early to climb it before heading to Negombo. 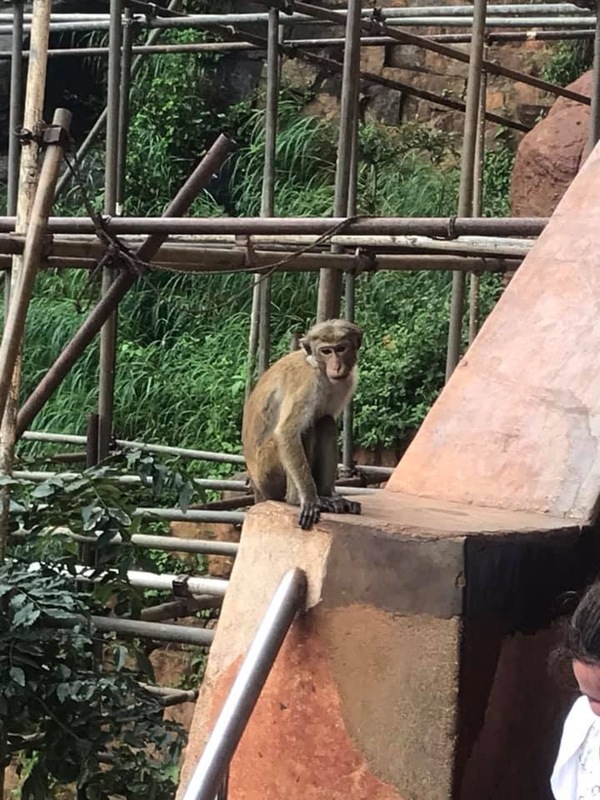 It is recommended that you climb Sigriya as early as possible. This is because it will be too hot later in the day and also the crowds are crazy later on. 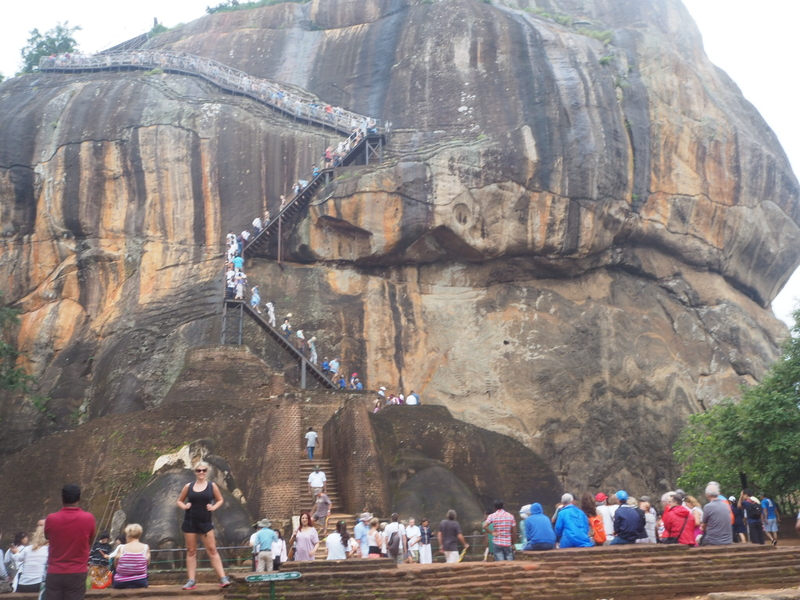 When we descended there were so many people waiting to climb up and we were glad we had gone early. 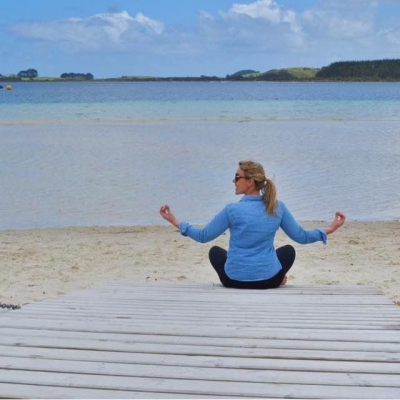 We loved this hotel – it was split into two parts with one round the corner from the other. Only one part has a pool and we were thrilled to be in the part closest to the pool. 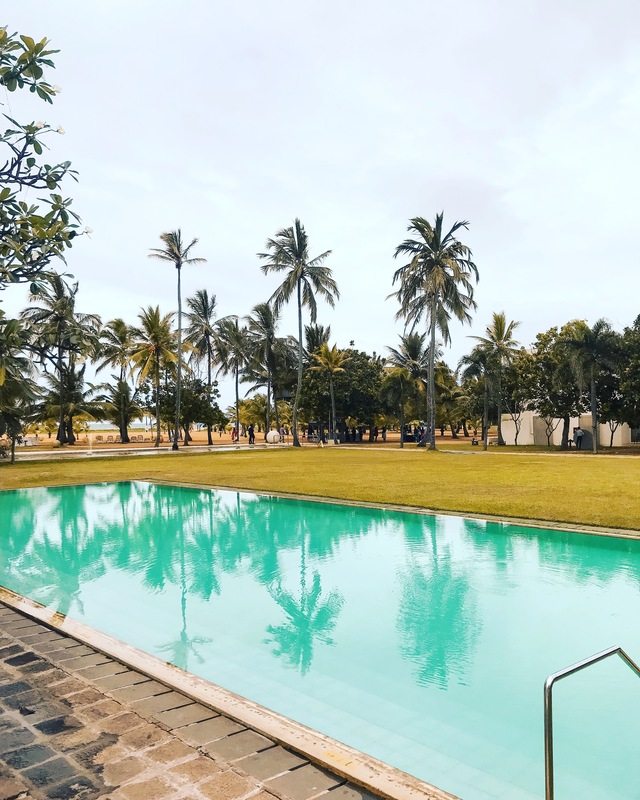 There’s not much to do in Negombo other than relax which is exactly what we wanted to do after a hectic couple of weeks travelling. 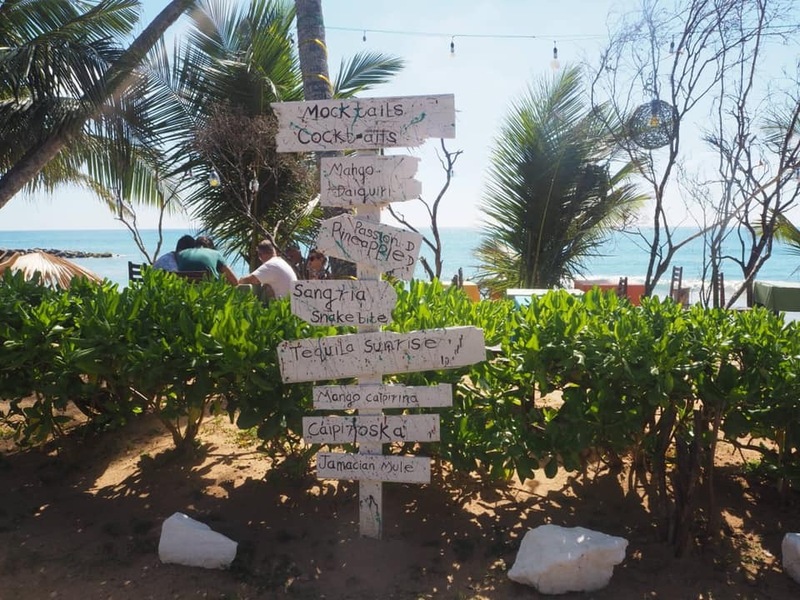 Hands down the best restaurant in Negombo, I’m ashamed to say we ate here three times which I would never usually do but the food and atmosphere was that good. 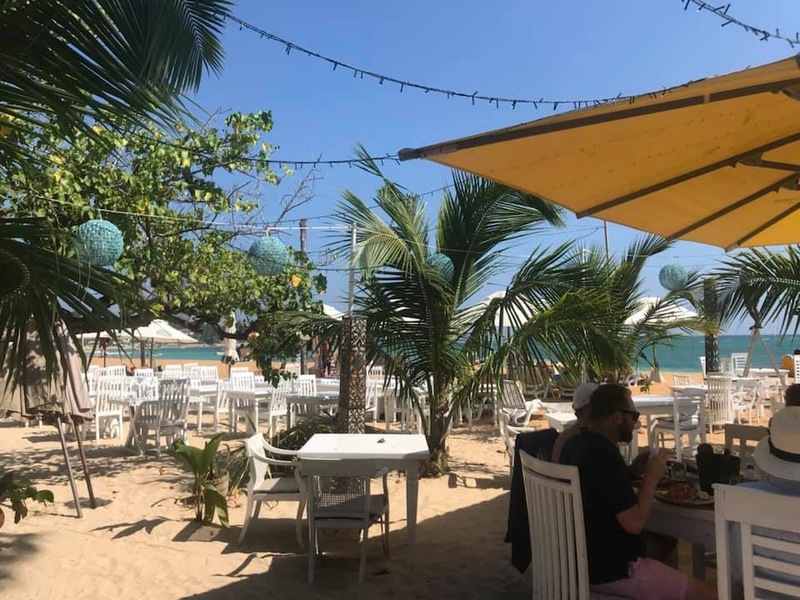 This is a great place for breakfast and lunch and if you walk through the cafe and sit outside at the back you will be facing the beach. And just like that our trip had come to an end. 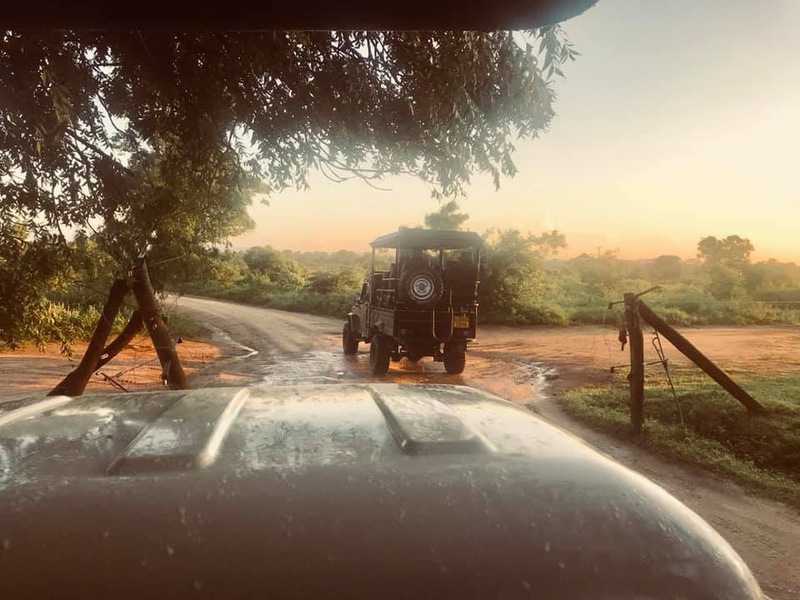 We had a fantastic two weeks travelling round and exploring Sri Lanka and I would wholeheartedly recommend it to anyone. 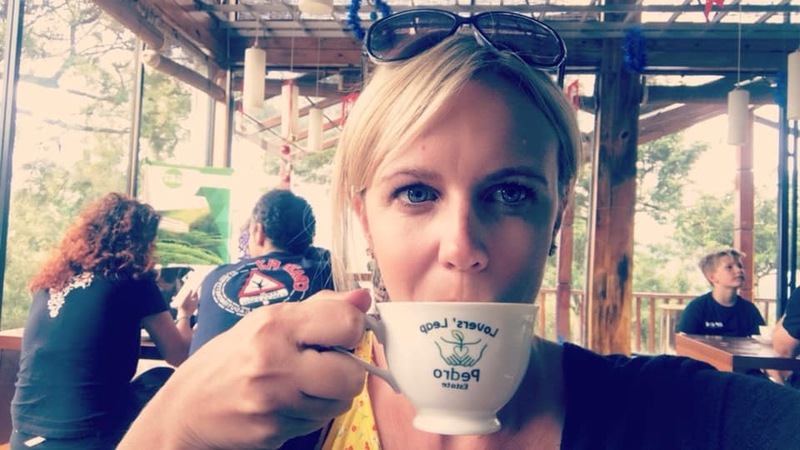 Let me know if you have any questions or want some more information on Sri Lanka.